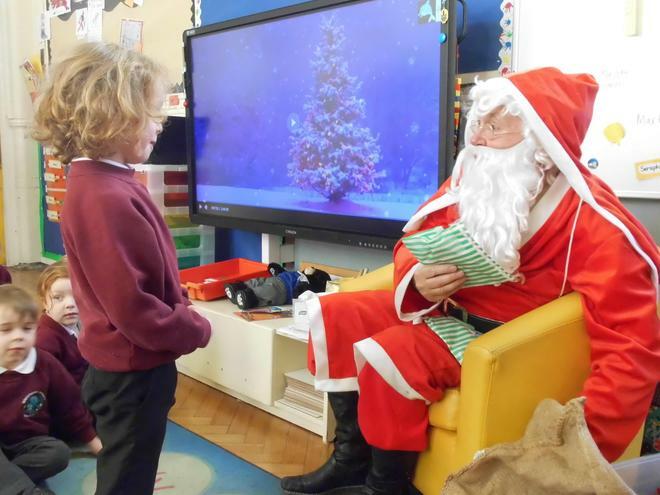 The children read the first sentence in the new book for this term, without any illustrations or the front cover of the book to go with it. 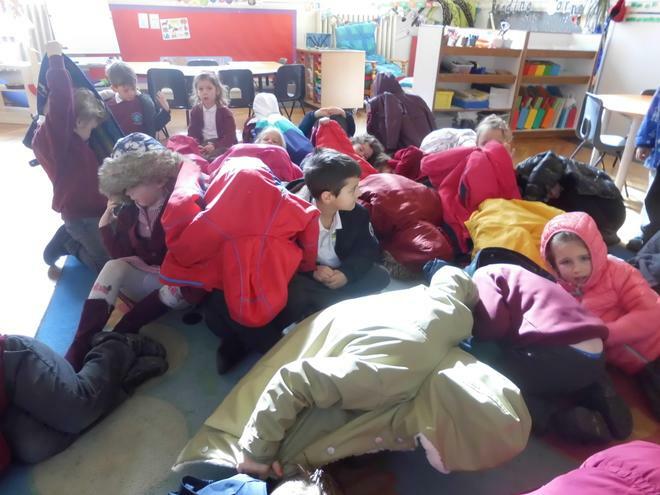 They had to use their imaginations and think about what the story might be about, including the setting and the characters. 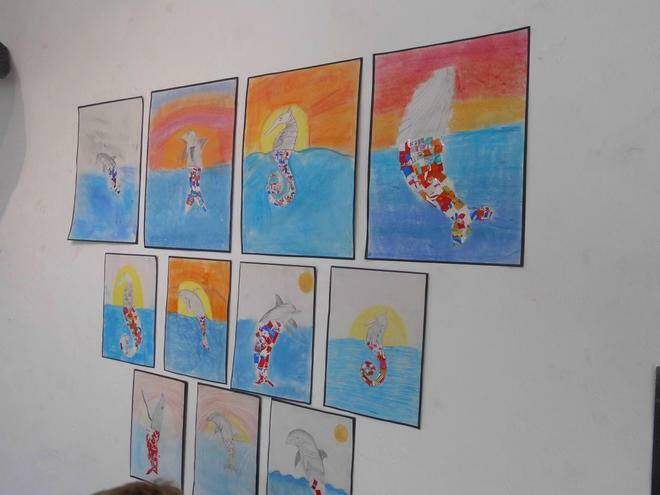 They explored the word 'hot' and created their own 'hot' artwork. 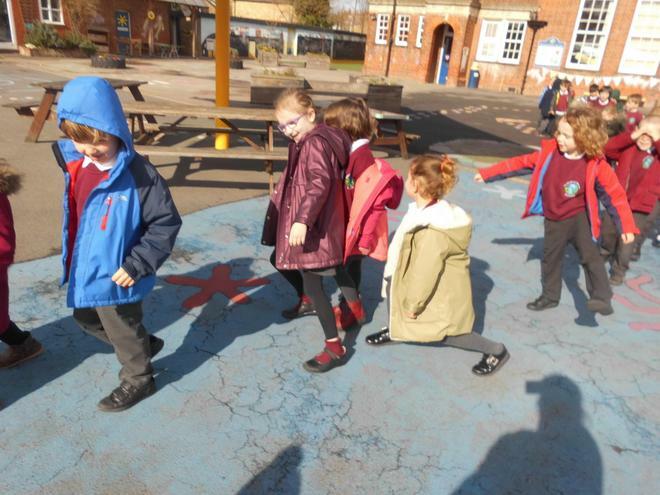 The children composed their own lines for a class poem about when they feel 'hot'. 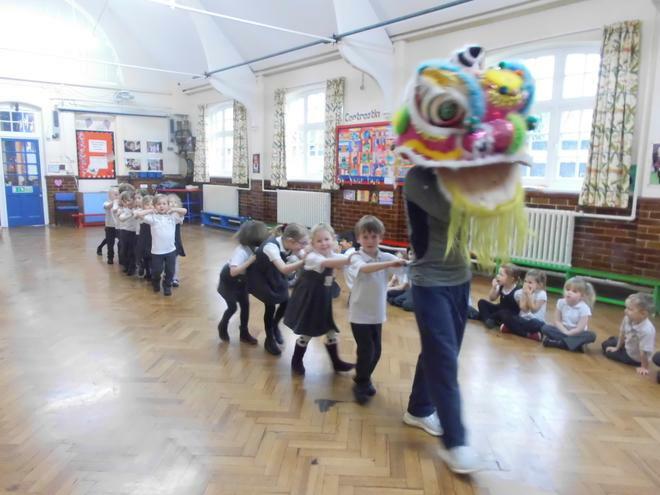 The author and illustrator Chris Wormwll came to visit the school on Monday 4th March. 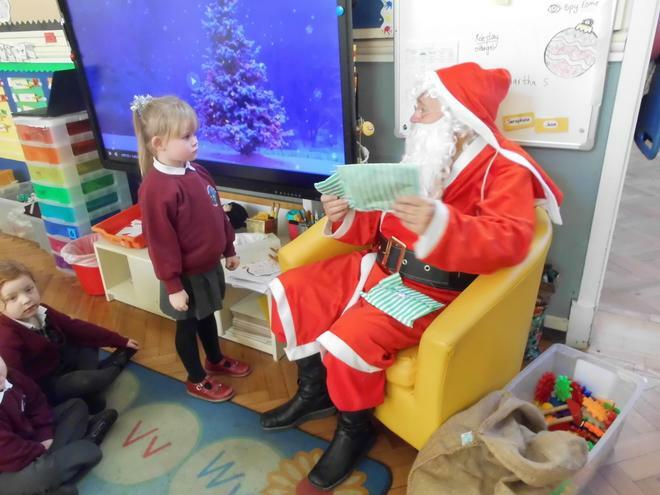 He read the children one of his fantastic stories called 'Scruffy Bear and the Lost Ball'. 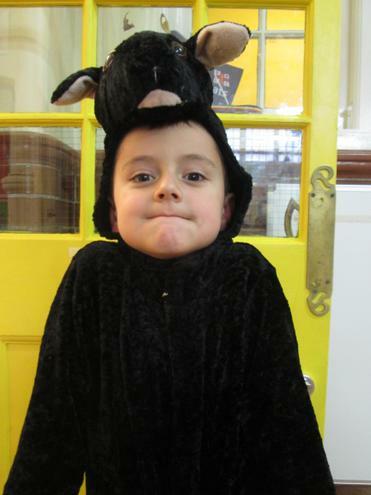 He created a brilliant creature for Yellow class made up of all different animals that the children suggested. 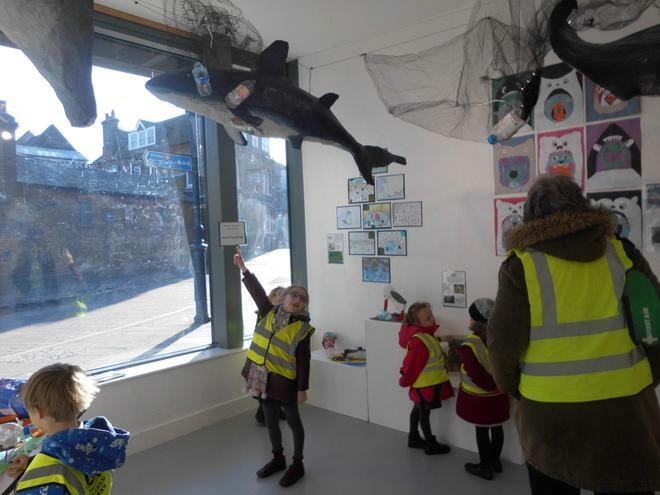 After his visit, the children were inspired to create their own mixed up creatures! 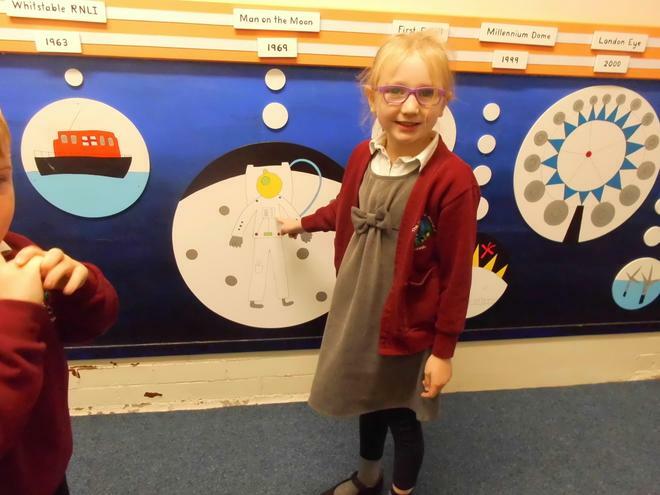 We created our own story box and retold the story 'Scruffy Bear and the Six White Mice' by Chris Wormell, using the small world animals and the white pompoms. 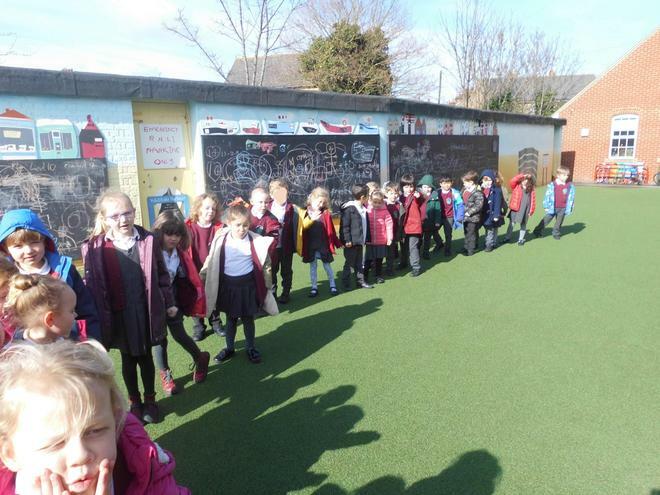 Yellow class enjoyed participating in pancake races with Orange class on Pancake Tuesday! 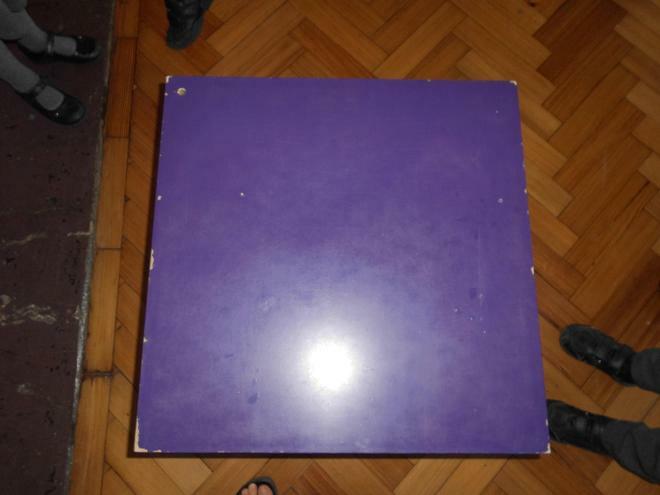 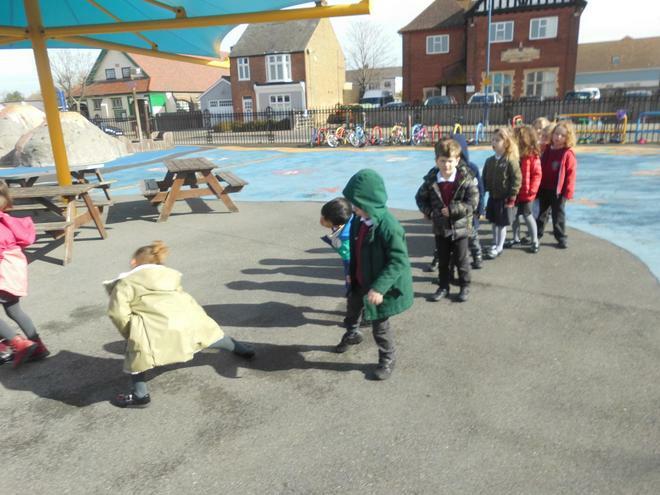 Some children managed to flip and catch the pancakes whilst running much better than the teachers! 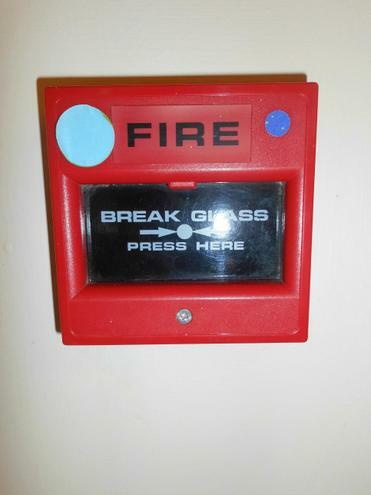 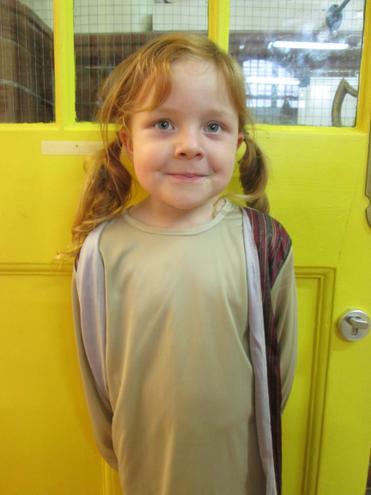 As part of World Book Day, the whole school (including the adults) dressed up as Wally or Wanda. 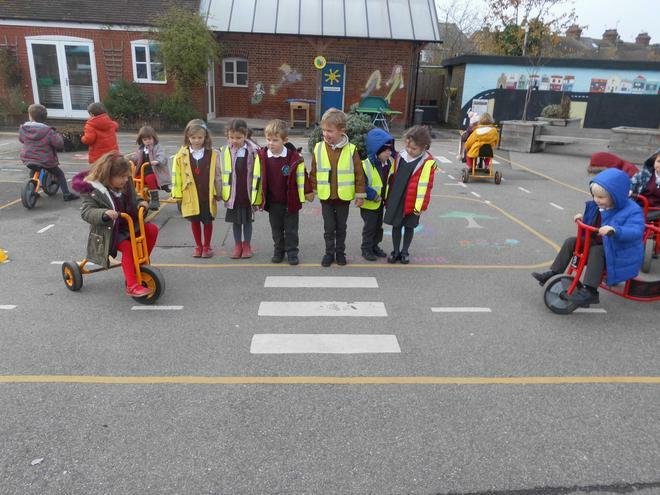 It was very difficult to see who was who! 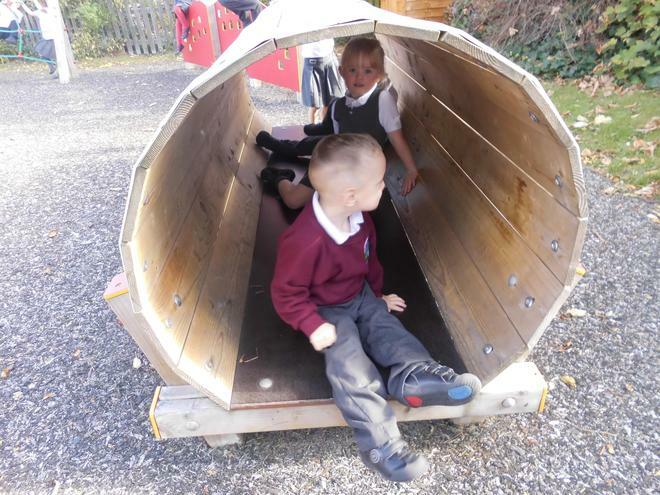 The children enjoyed sharing their favourite stories with each other. 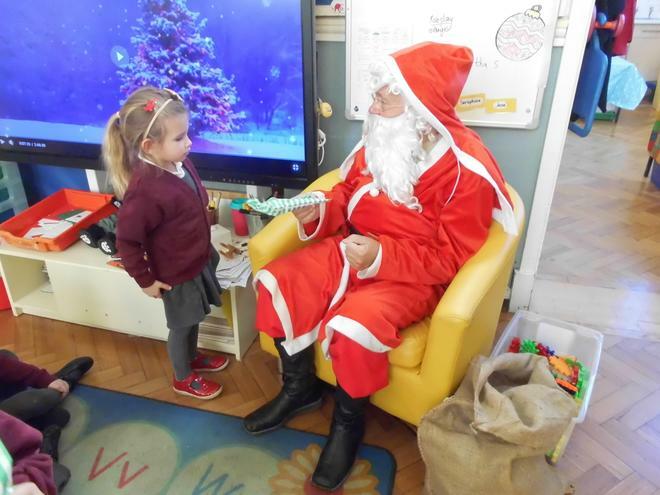 In the afternoon some of the children's mums and dads came in to share their favourite stories with the children. 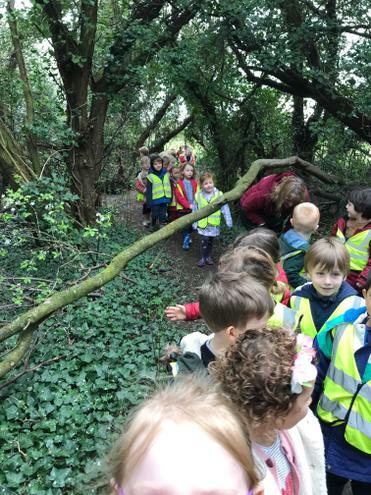 Everyone had a brilliant time visiting the woodland area at Swalecliffe School and travelling on our school minibus. 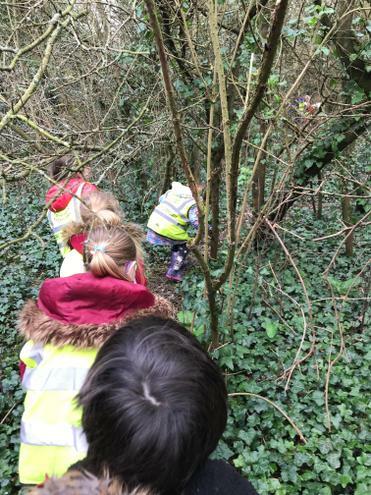 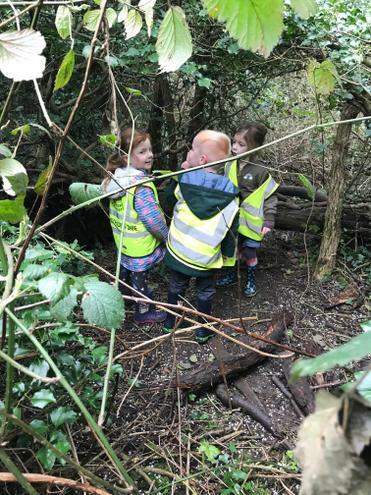 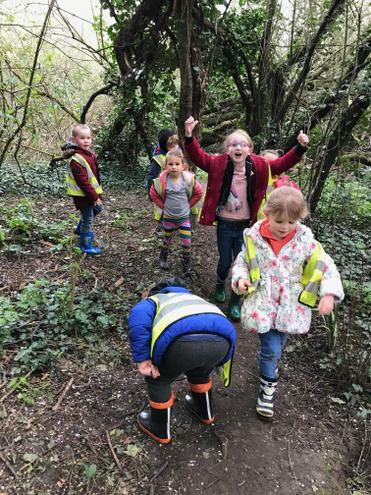 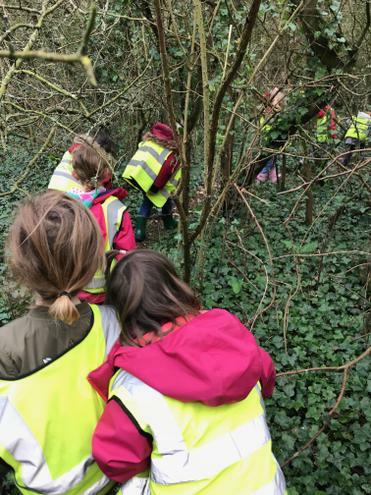 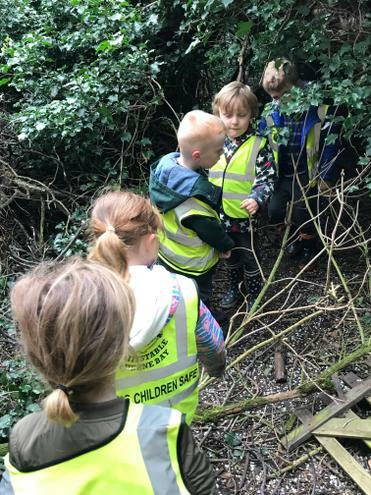 The children explored the woods, going over, under, around and through the trees! 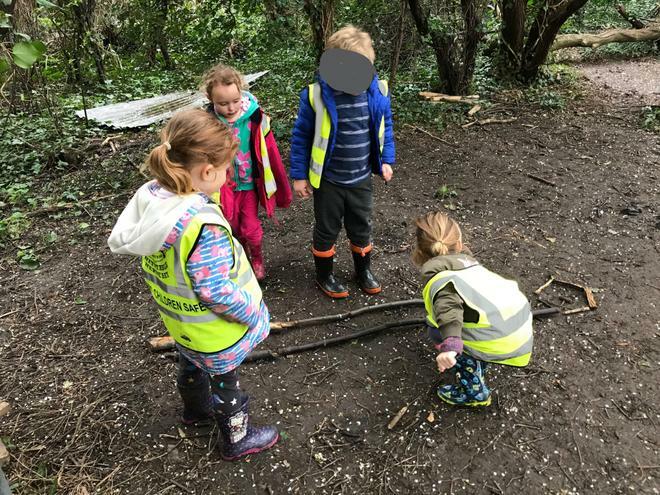 Some children created their own artwork using the branches, twigs and leaves they found on the floor. 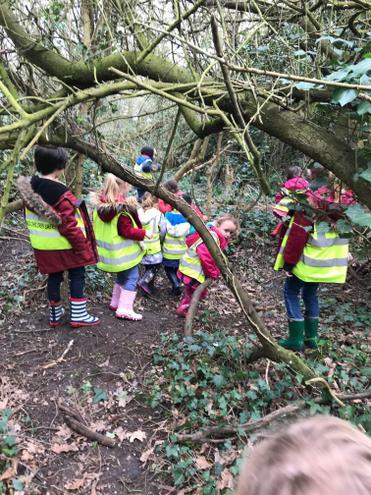 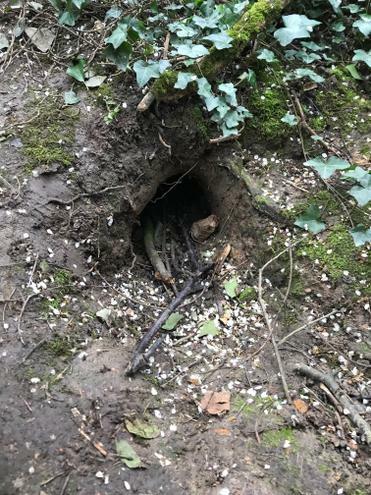 The children found many areas which looked a bit like bear caves. 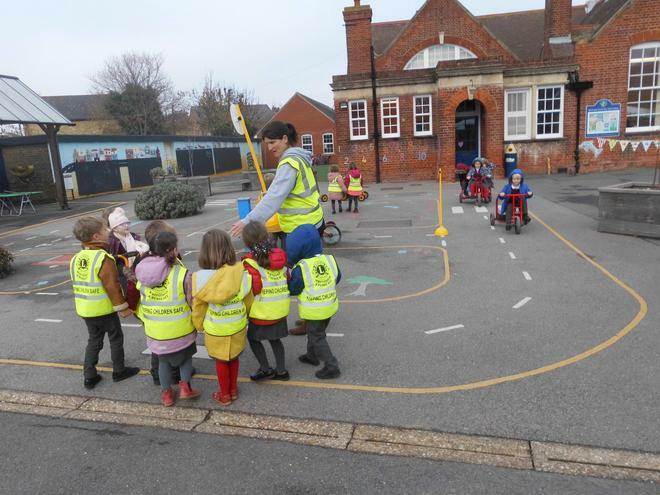 The children were very lucky to watch the practise launch of the Whitstable Lifeboat and find out about it from the crew members. 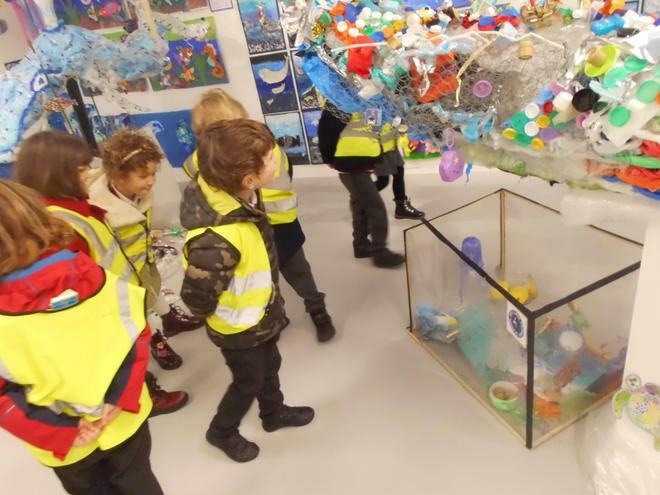 The children have enjoyed sorting and arranging their beach treasures. 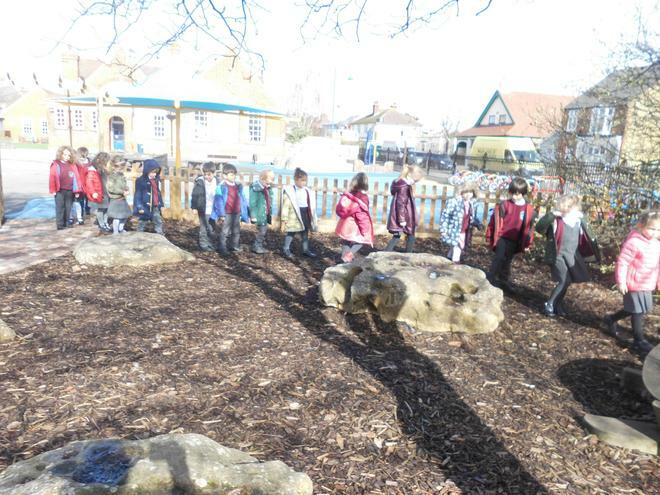 They looked at the different sizes, shapes and colours of the shells and stones. 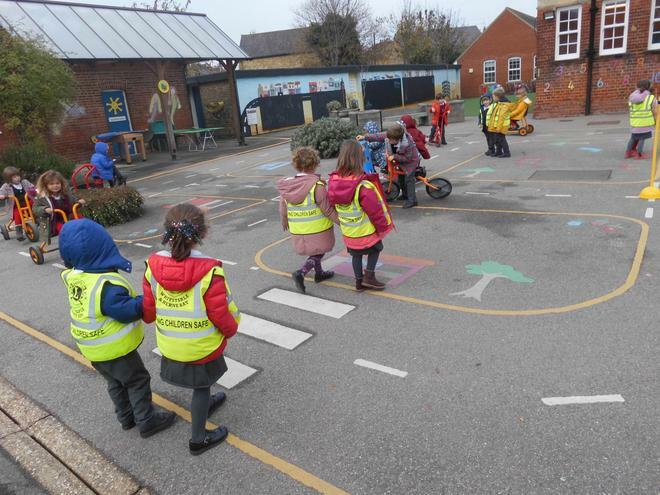 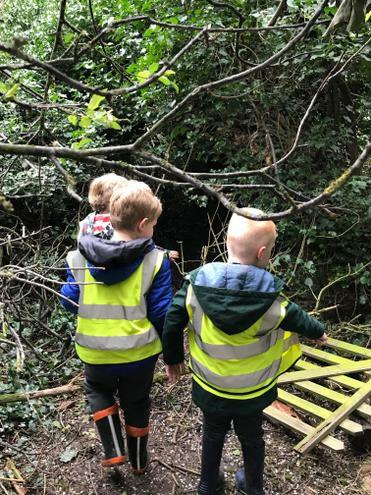 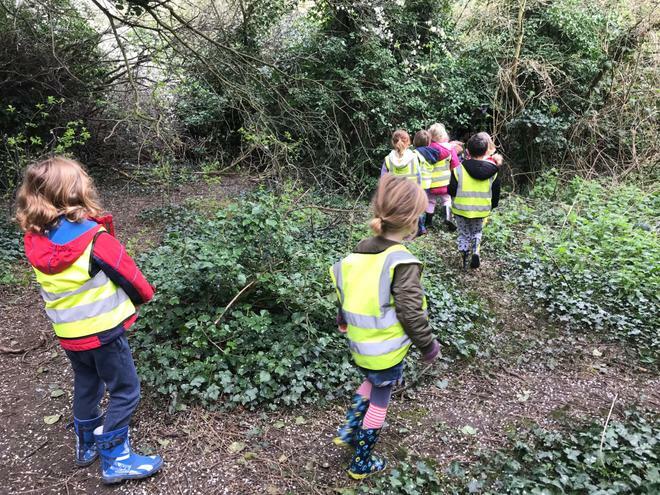 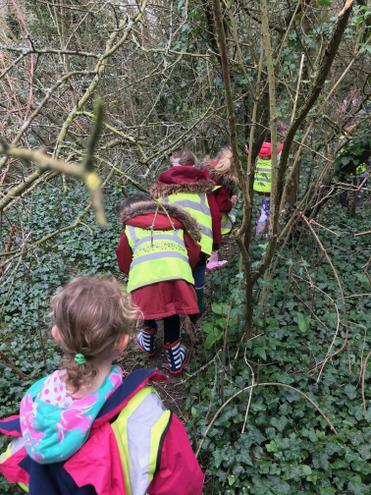 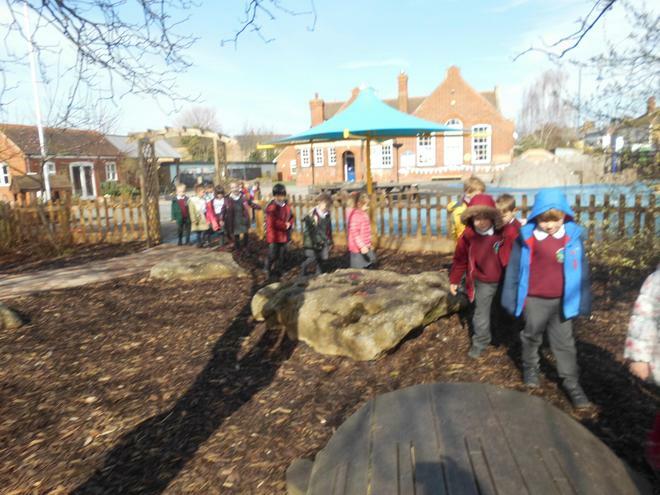 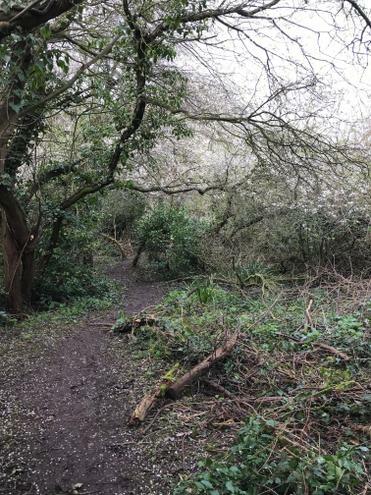 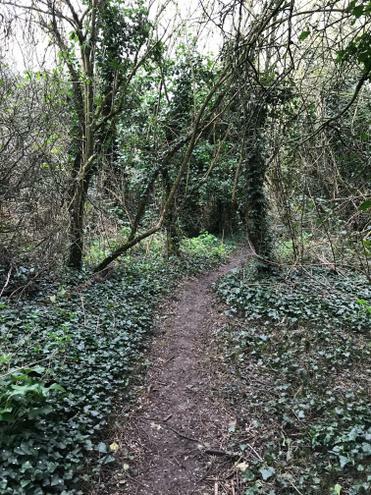 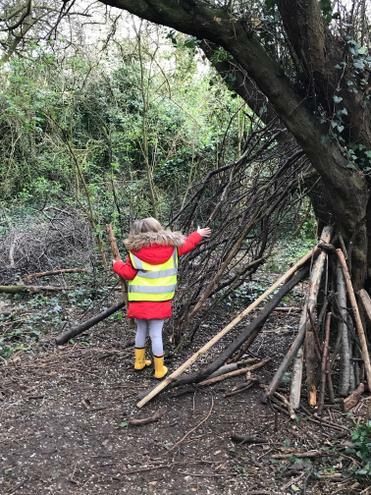 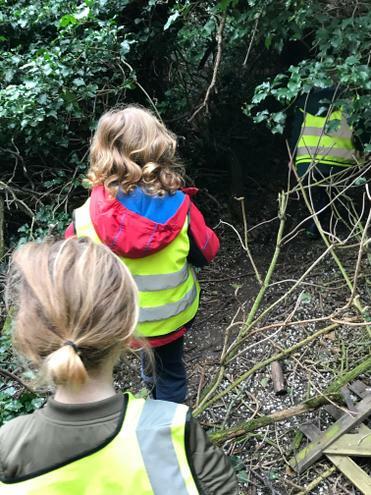 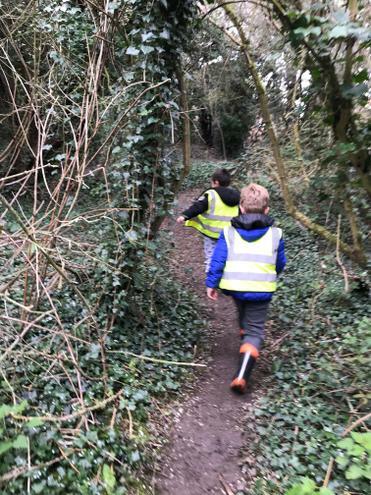 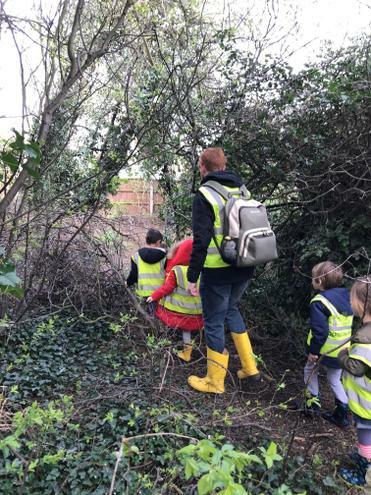 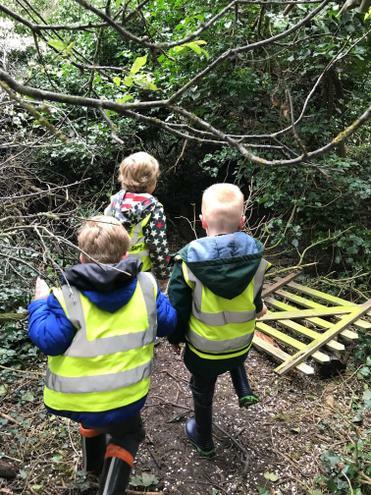 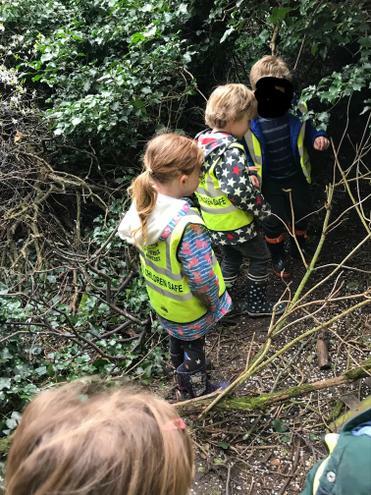 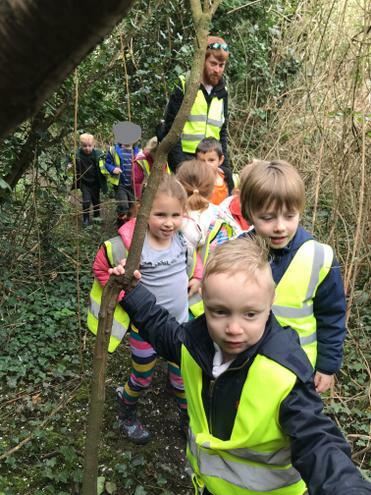 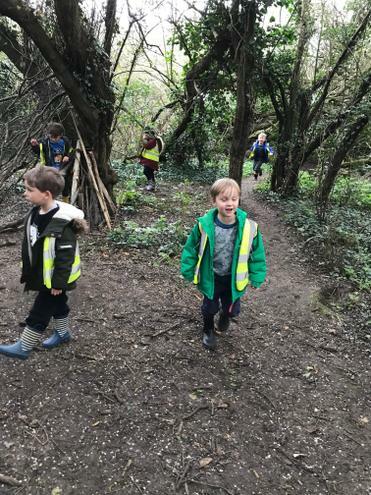 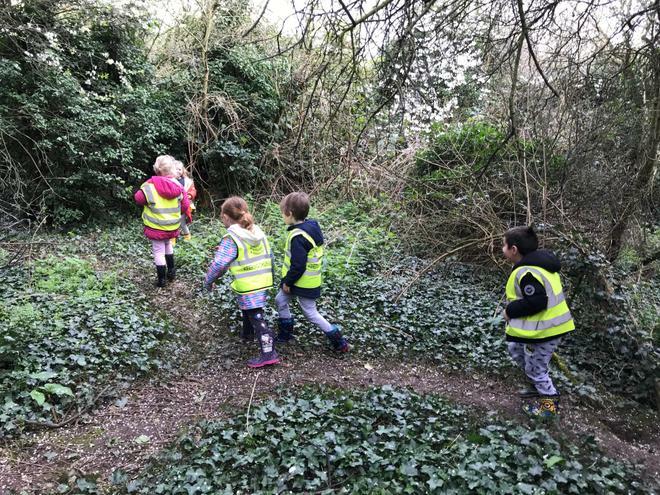 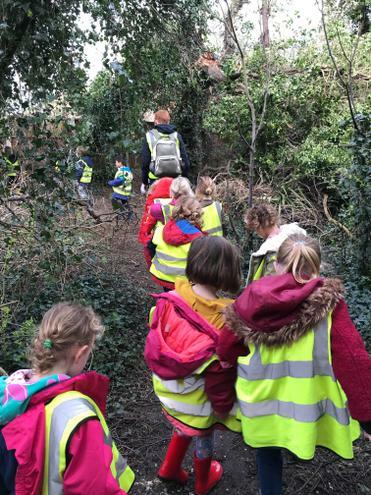 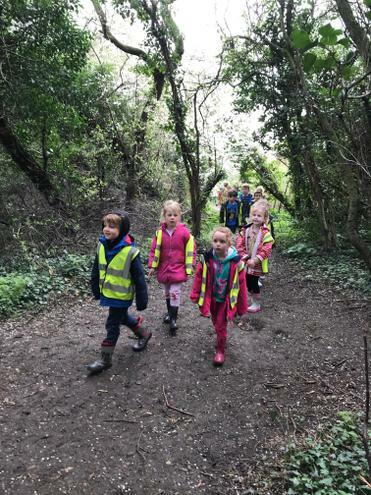 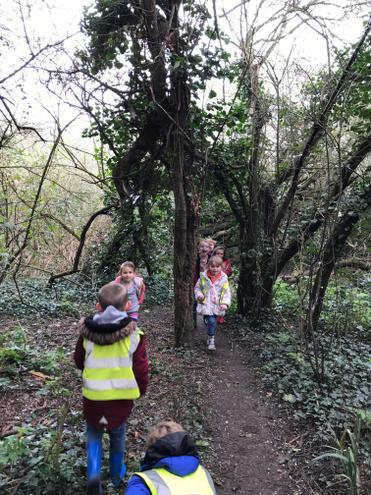 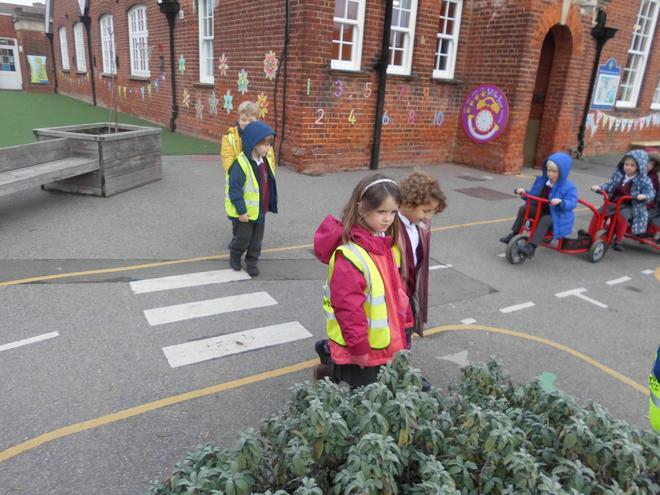 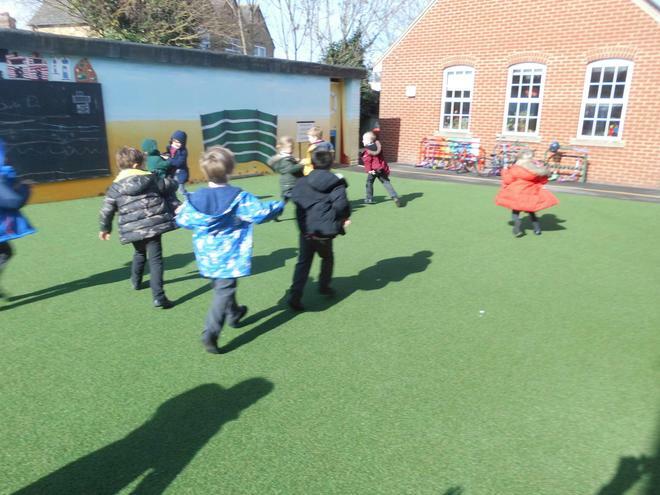 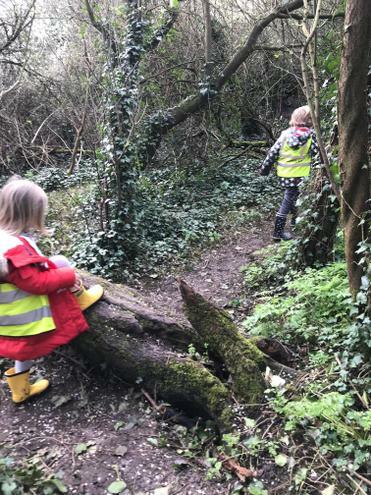 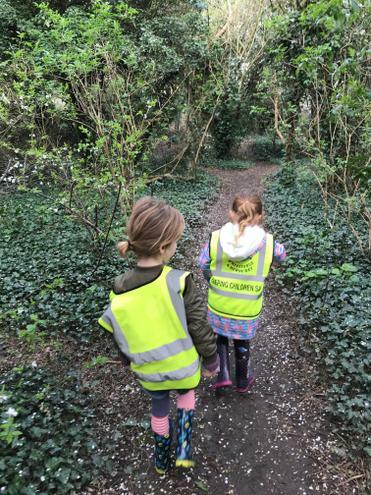 After reading the story 'We're Going on a Bear Hunt' by Michael Rosen and the woodland vist, the children decided to go on a bear hunt around the school to look for bears. 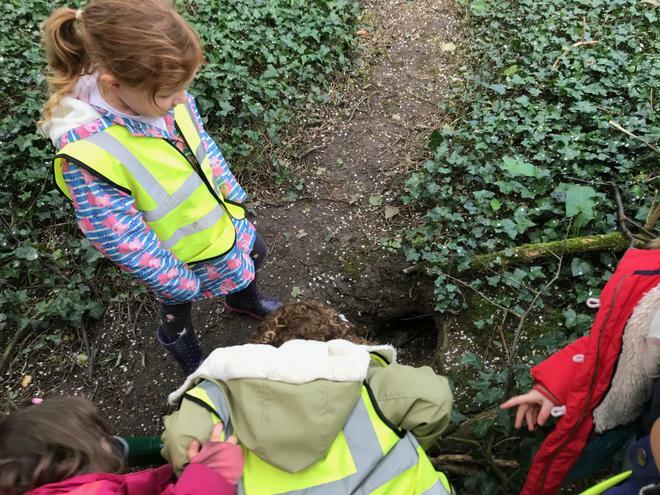 They found places to re-enact the 'swishy swashy grass', the 'thick oozy mud', the 'cold river' and the 'narrow, gloomy cave'. 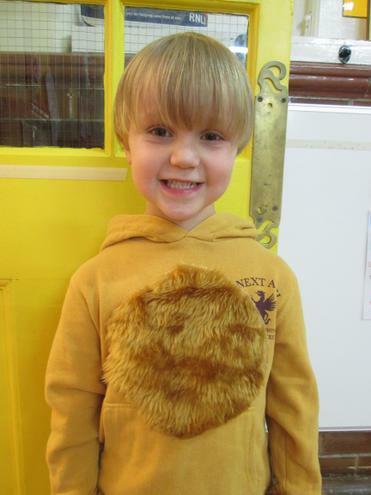 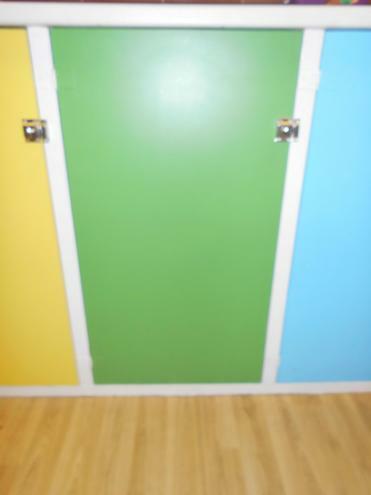 This term the children started by reading the story and singing songs about 'Goldilocks and the Three Bears,' accompanied by the percussion instruments. 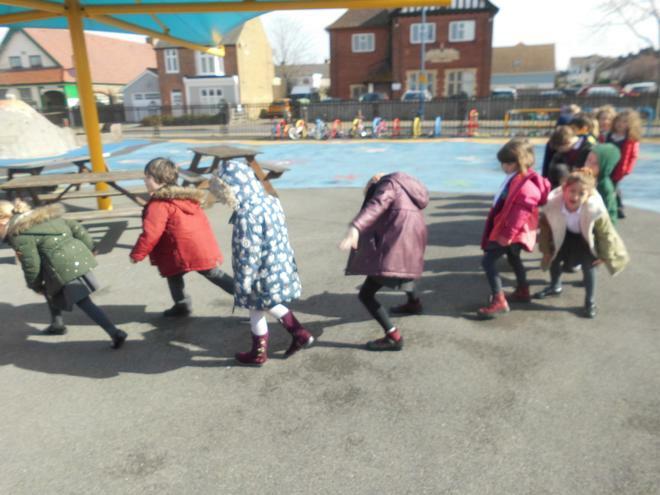 Over the next few weeks they explored different instrumental sounds; high/ low (pitch), fast/ slow (tempo), loud/ quiet (dynamics). 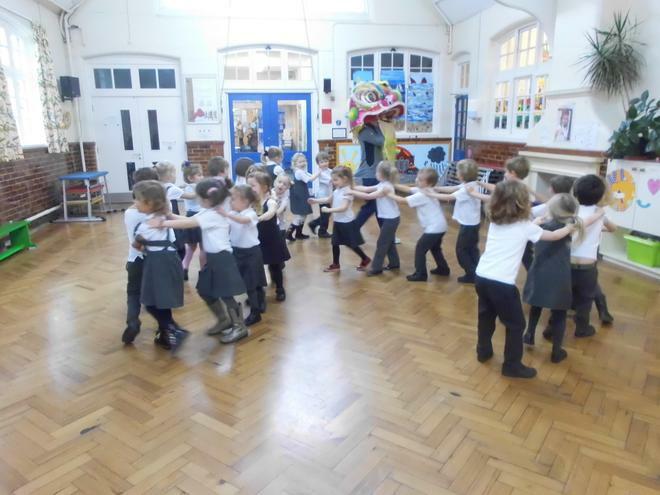 They created their own band, following Mrs Diamond as the conductor. 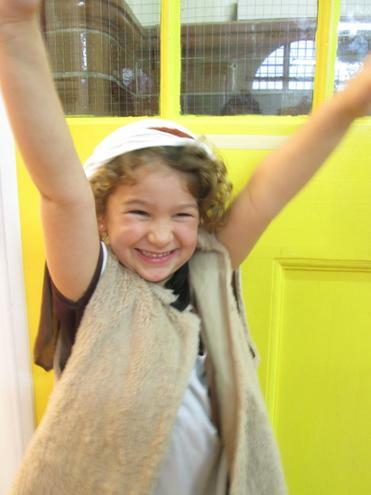 For the children's last music session they had to listen to the music 'Lark Ascending' and moved their feather gently in time to the music. 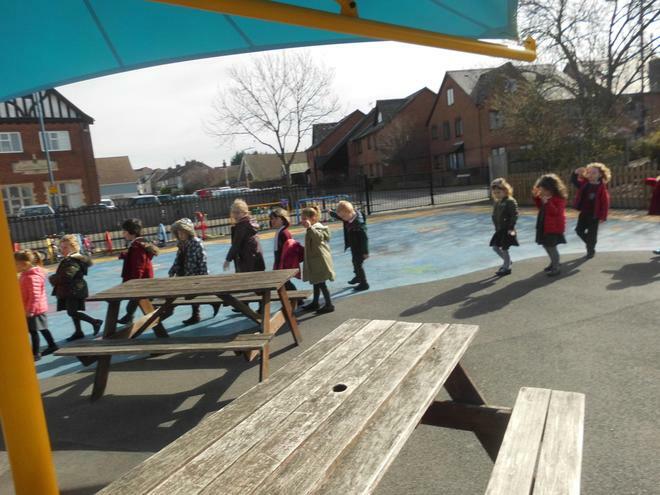 Mrs Diamond also taught the children a fun clapping song. 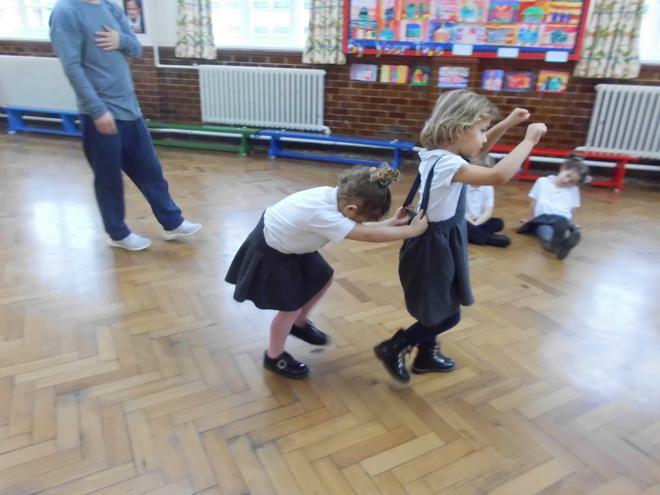 Everyone enjoyed watching the Pantomime and joining in with the singing and dancing! 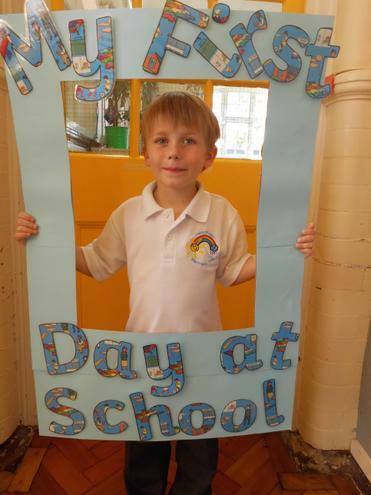 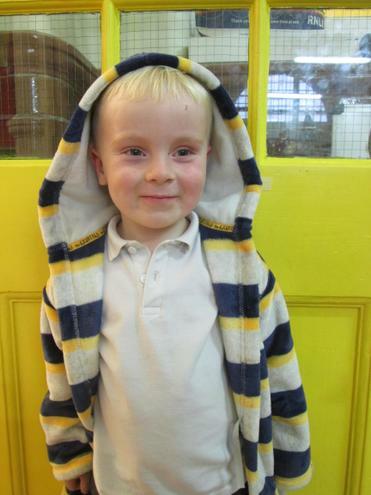 This term we are been focusing on the story 'Puffin Peter'. 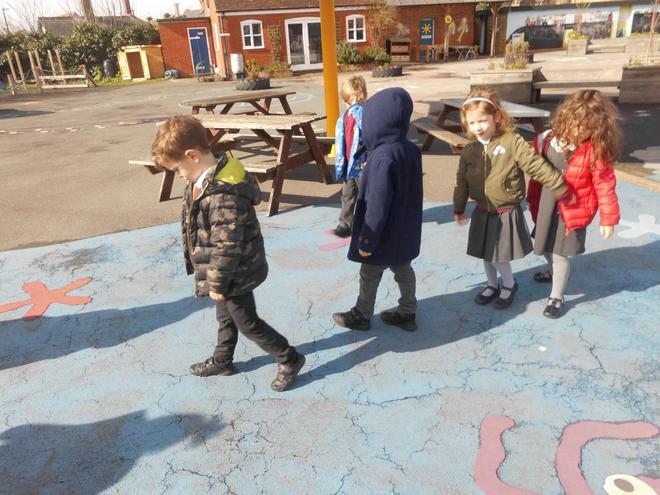 So far the children have been finding out about puffins and describing the appearance of the Puffin Peter on the front cover using different adjectives. 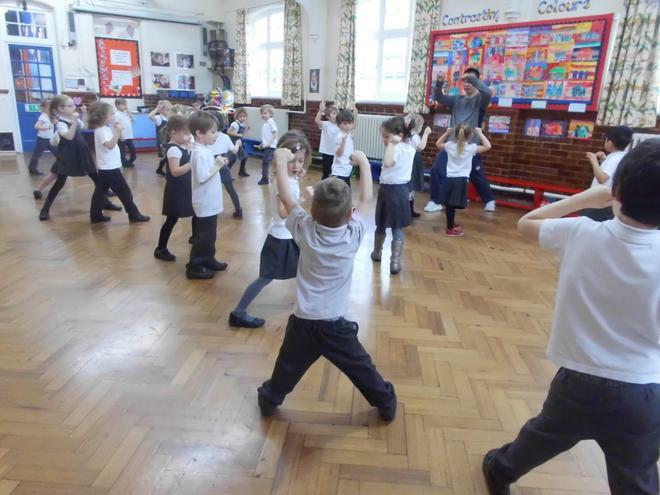 The children had so much fun taking part in the HIIT session with the fire fighters! 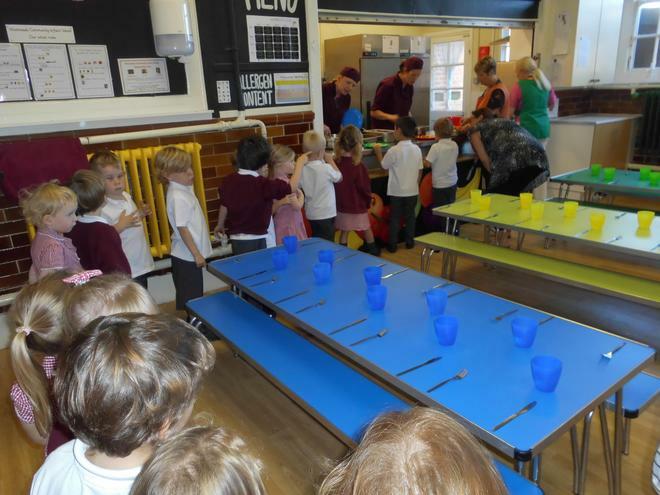 It required lots of energy and everyone certainly needed a big drink of water afterwards! 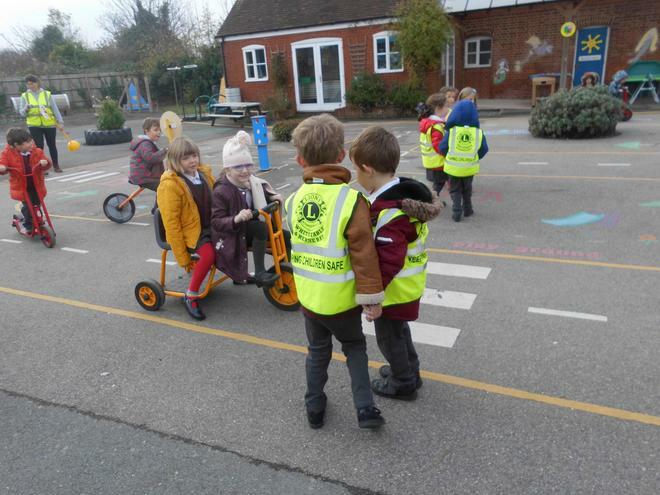 Every Friday afternoon this term, some of the Year 2 children are planning on visiting Yellow and Orange class as 'Reading Buddies' and sharing their favourite stories with the younger children. 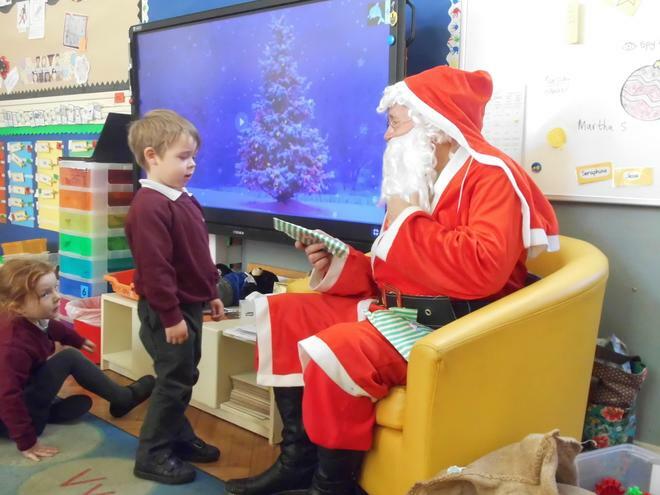 The Reception children are enjoying listening to them read, as well as sharing their favourite stories with them too. 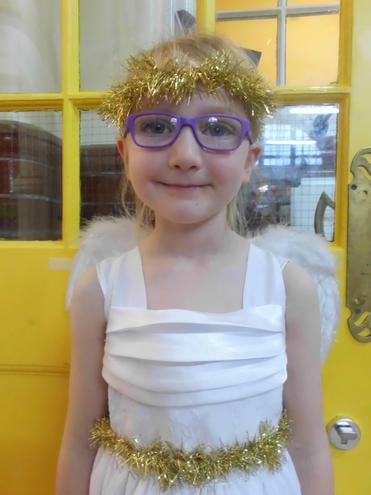 This term Mrs Diamond has been working with Yellow class and introducing them to some of the instruments she plays, particularly recorder, ukulele and guitar. 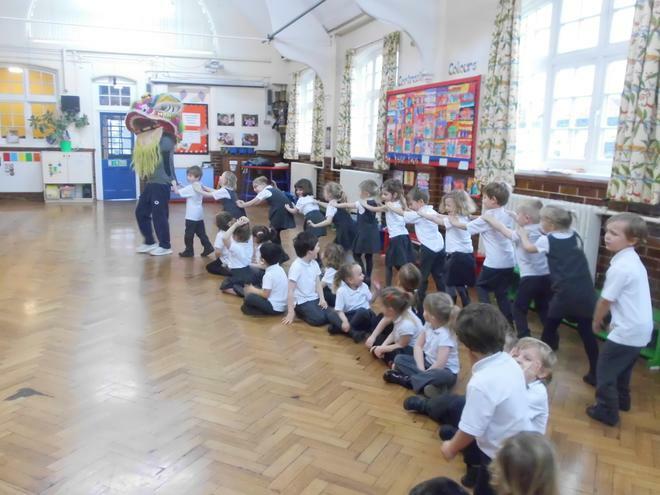 She has taught the children new songs, including one about what can be seen 'Under the Sea'. 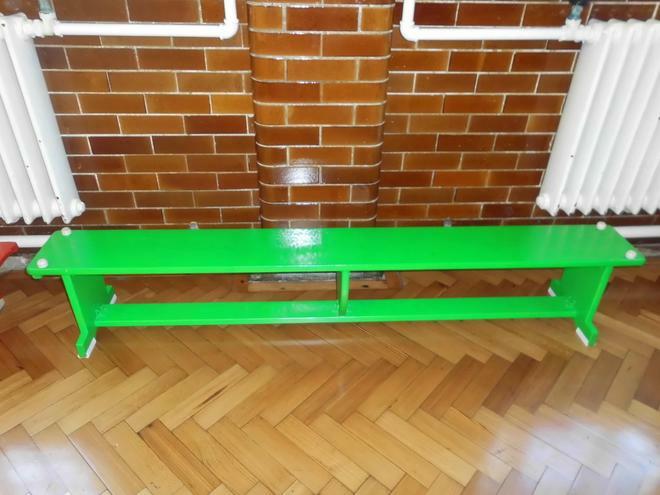 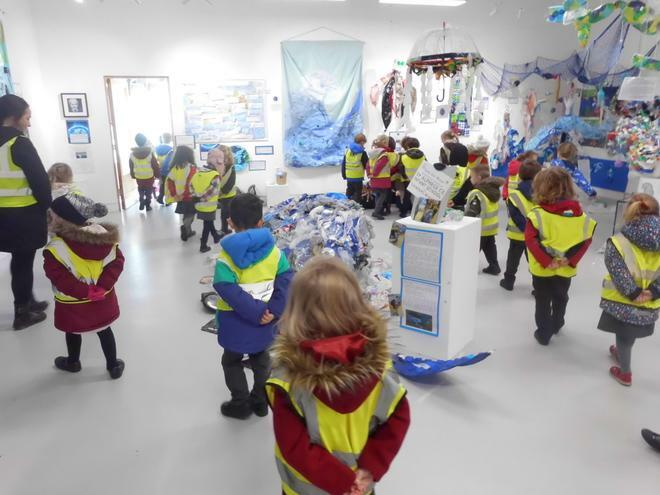 The children have had opportunities to play different musical instruments including chime bars, egg shakers and claves/ rhythm sticks to accompany the songs while they sing and have enjoyed playing games using a special stretchy fabric to represent the sea. 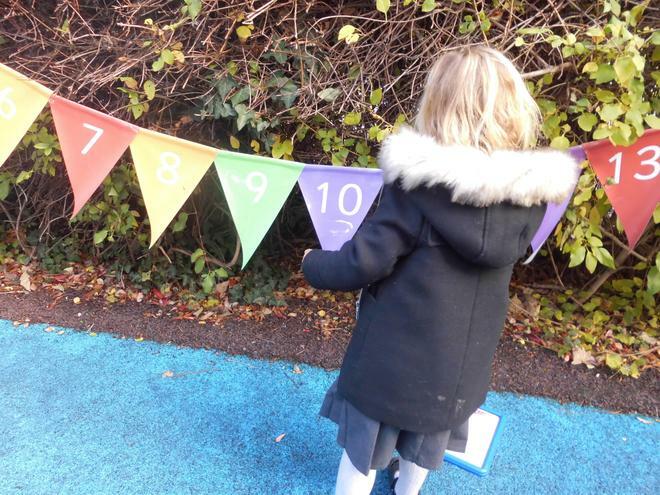 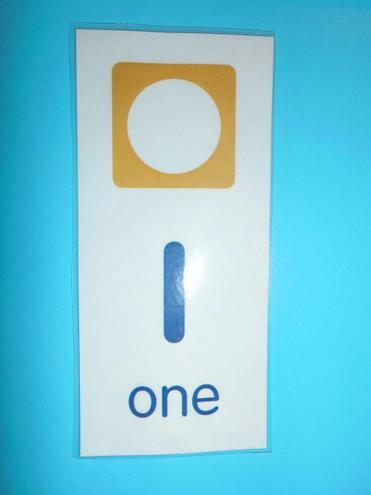 This term the children have been working with numbers 0-10. 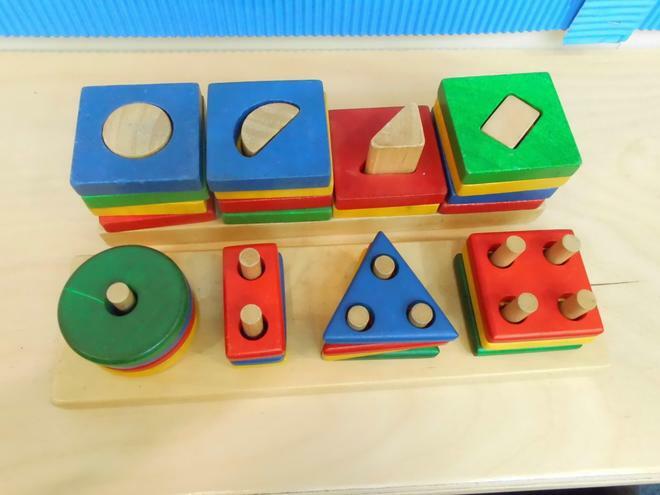 They have been engaging in different games and activities to practice writing numbers, counting groups of objects, representing the numbers in different ways, and adding and taking away two groups. 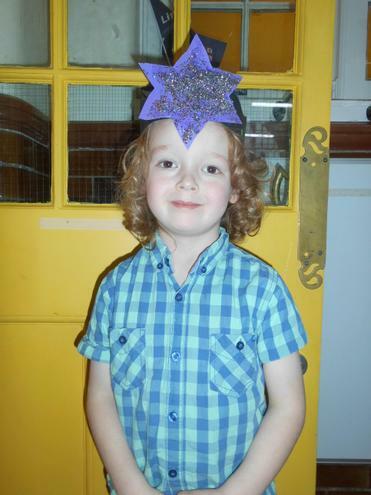 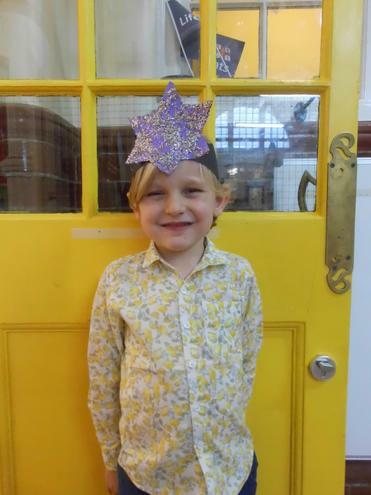 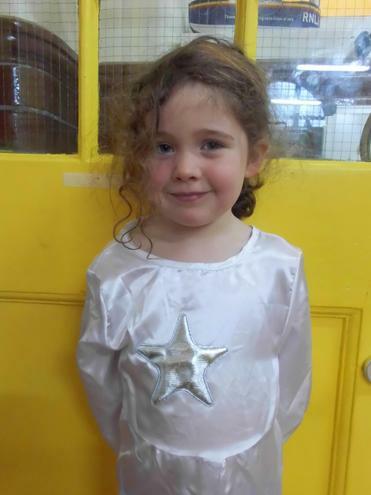 The children enjoyed acting out their superpowers and going on an adventure in their Superheroes drama workshop! 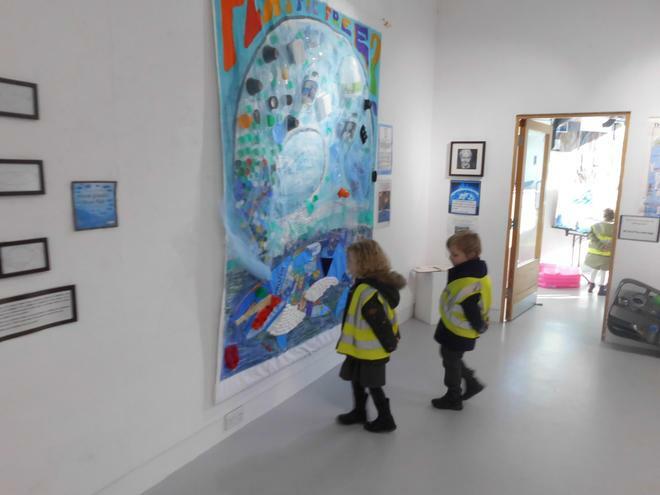 The children and adults enjoyed creating lots of different artwork based around the story 'Hooray for fish'. 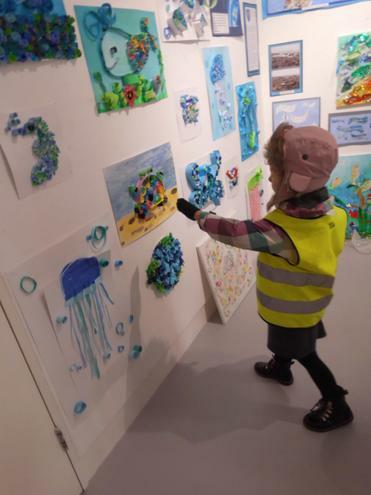 Everyone was busy mono-printing, wax resist using watercolour paint and pastels, computer art, creating a giant collage rainbow fish, drawing sea creatures or plants collaboratively on a large blue sheet of paper and junk modelling. 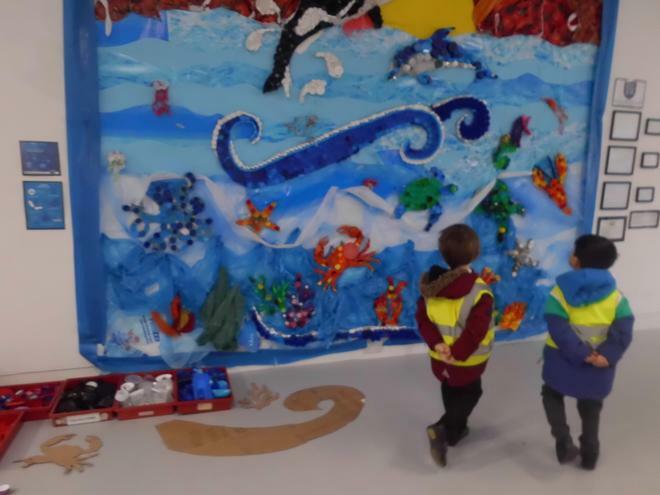 All the finished artwork looks amazing! 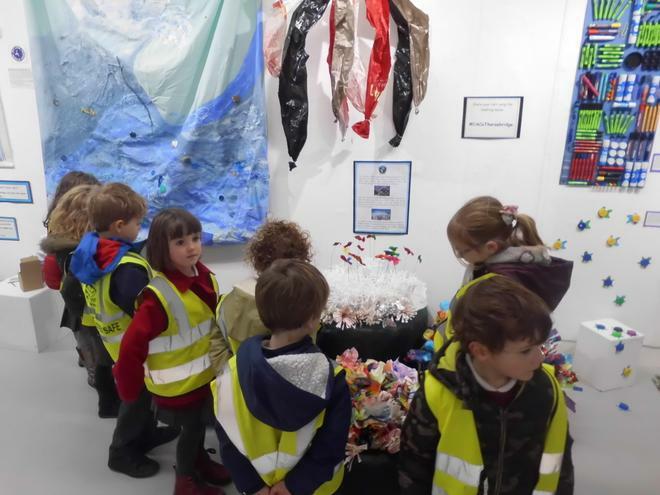 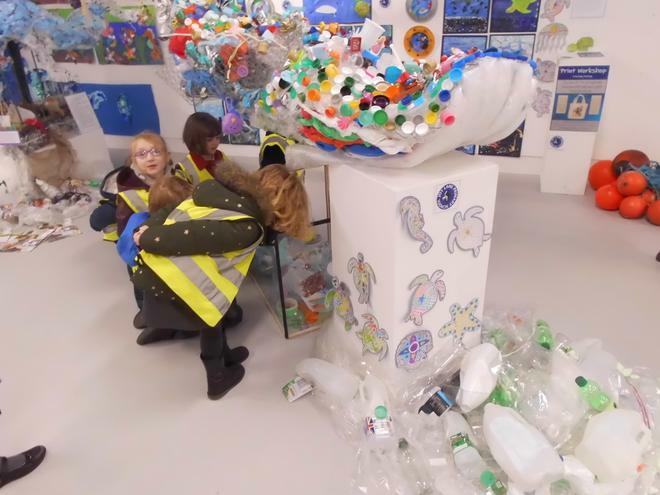 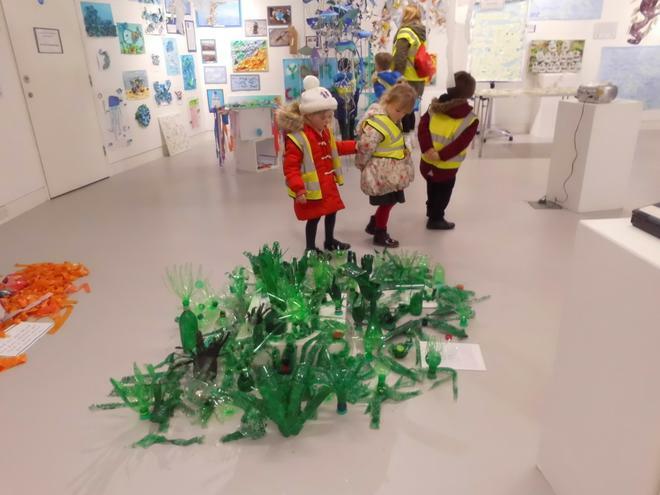 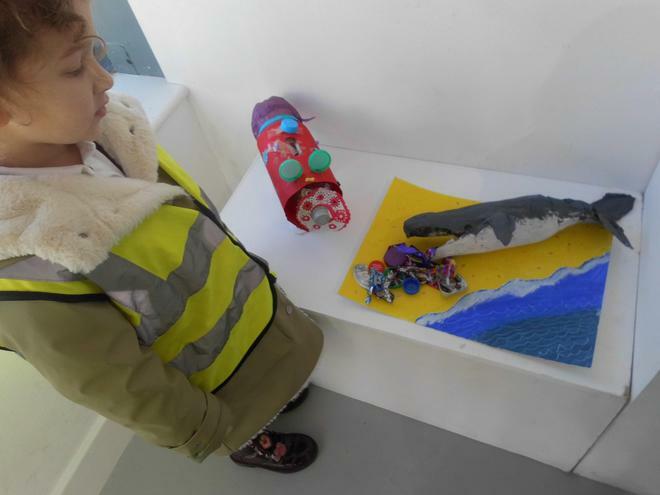 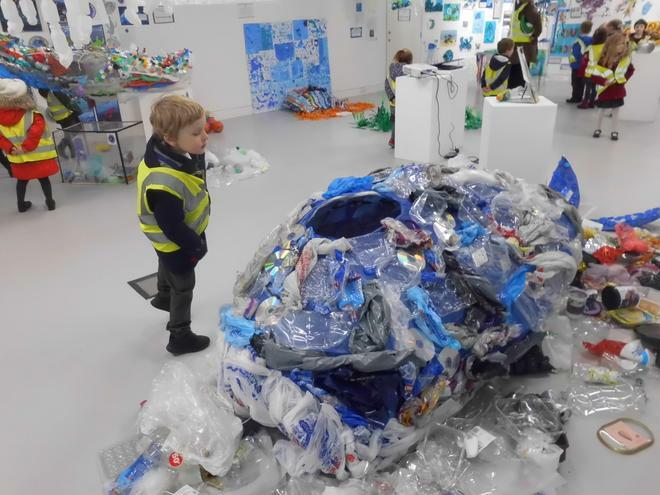 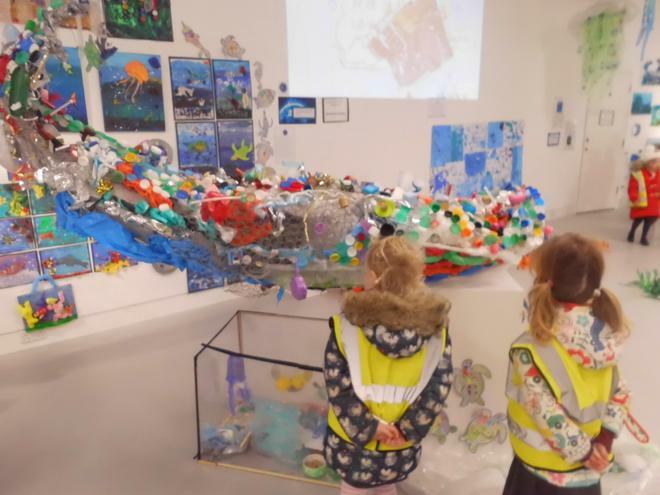 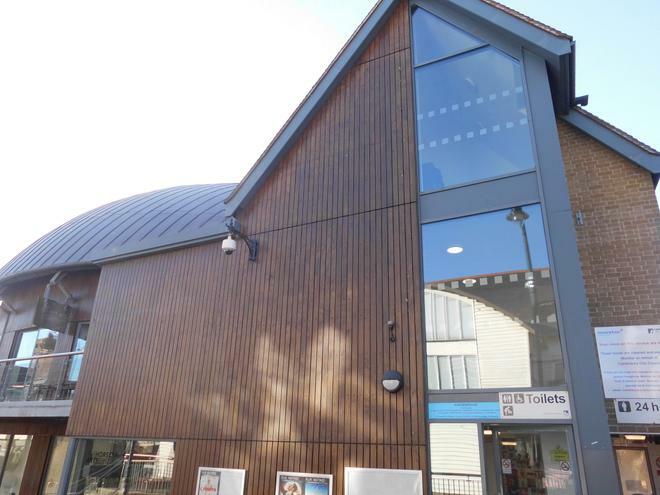 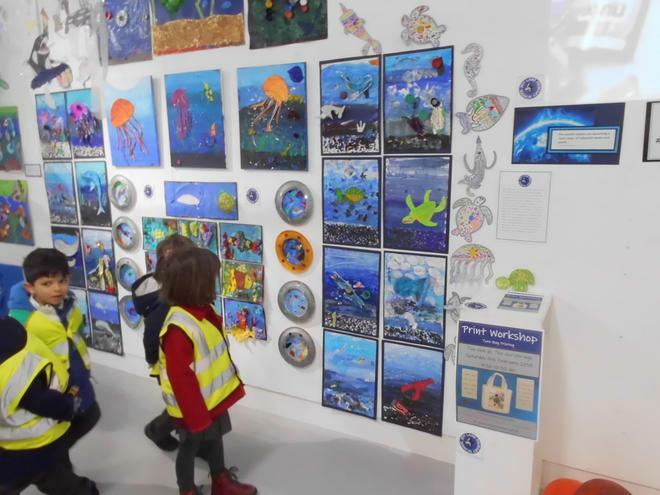 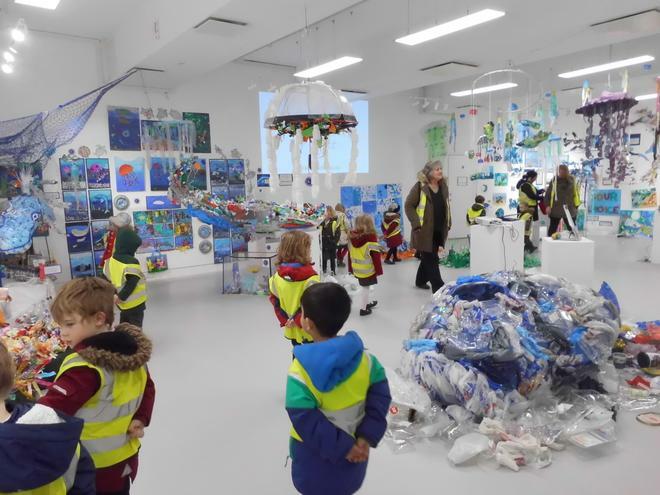 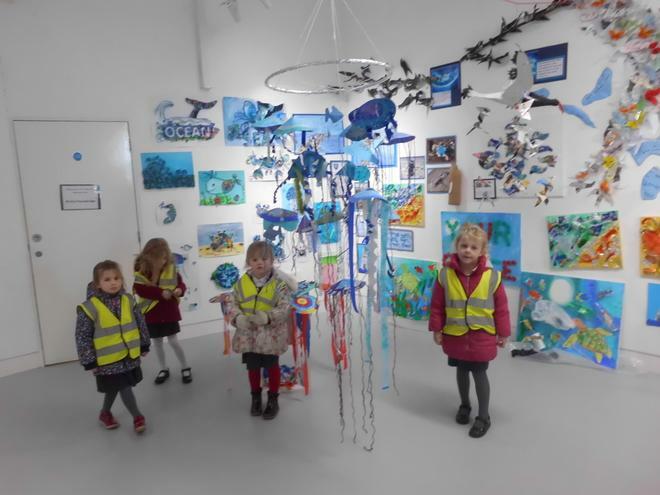 Yellow class enjoyed visiting the Horsebridge Art Center in Whitstable to look at recent 'The Blue Planet' art exhibition. 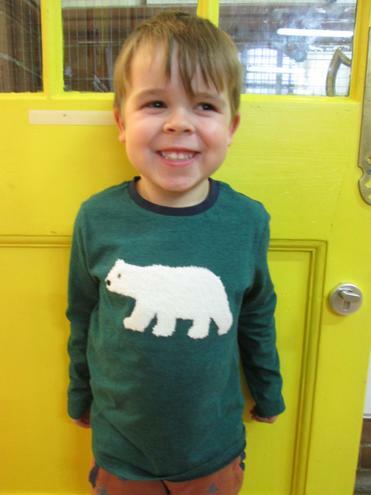 They each chose their favourite pieces and talked about why they liked them. 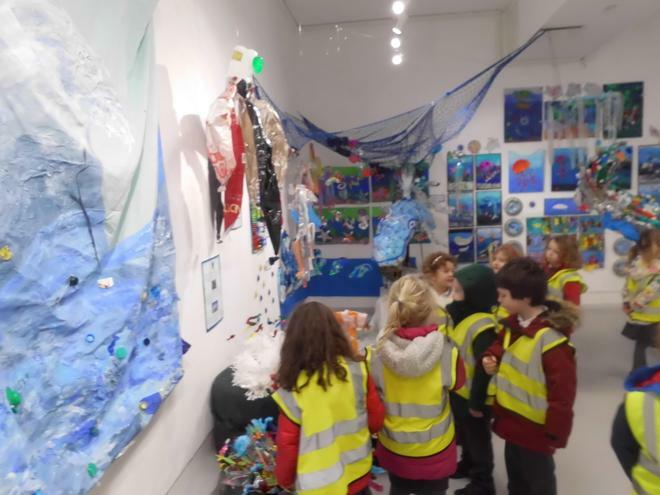 There was lots of discussion amongst the children about how plastic rubbish is currently effecting the sea animals and they started to think of different ways they could help to help improve our seas. 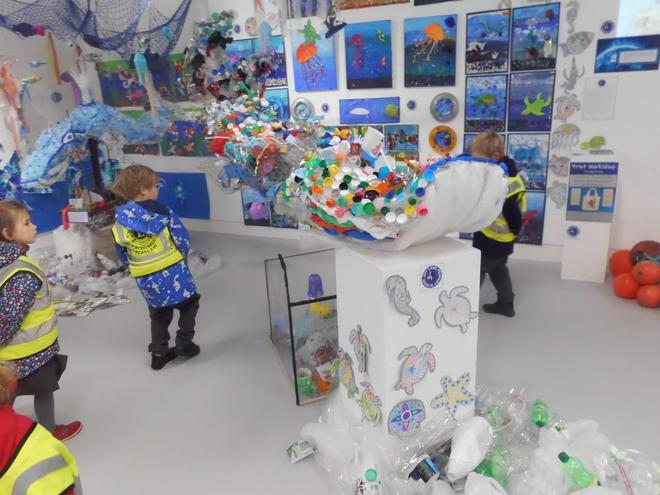 Some of these ideas were to have an alarm to warn people when plastic goes into the water, writing a letter to sea creatures that divers would read to them, reusing and recycling plastic, using plastic alternative to things we use everyday and to make posters to tell people not to throw rubbish in the sea. 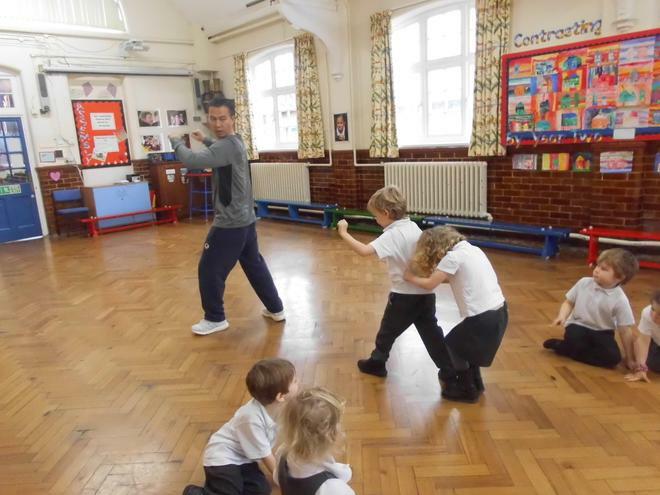 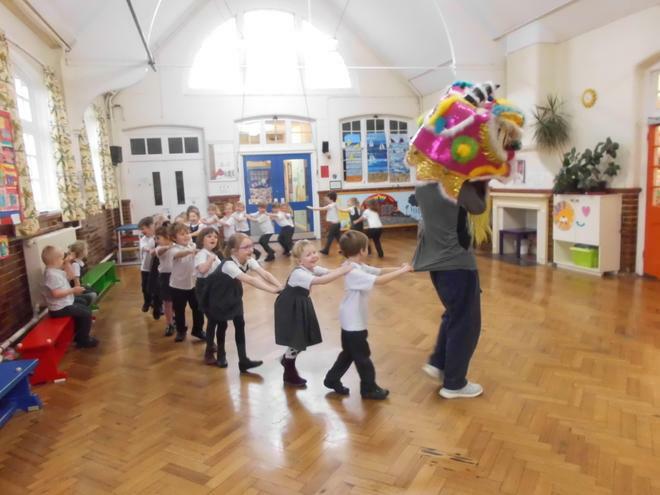 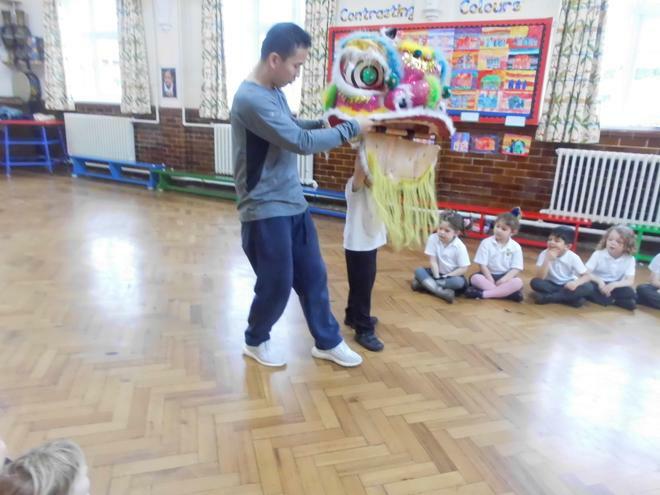 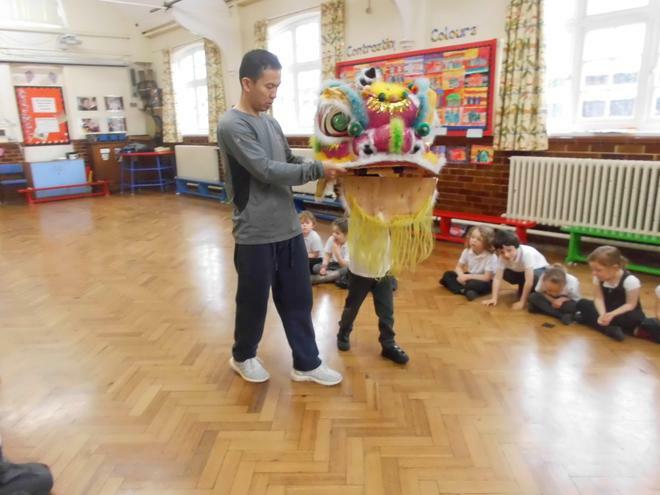 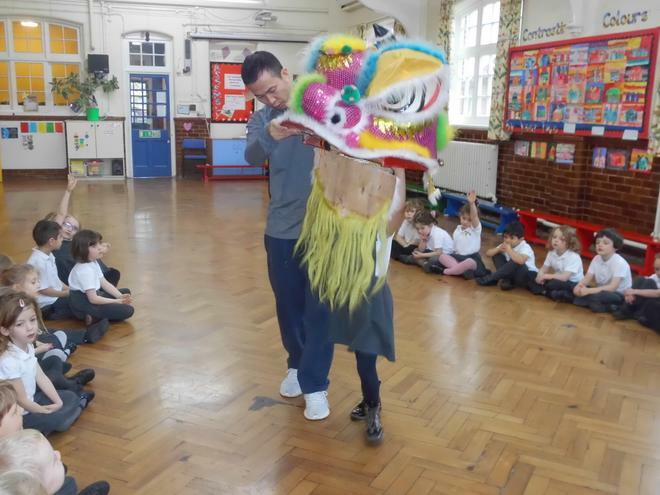 The children enjoyed participating in the Lion Dance Workshop. 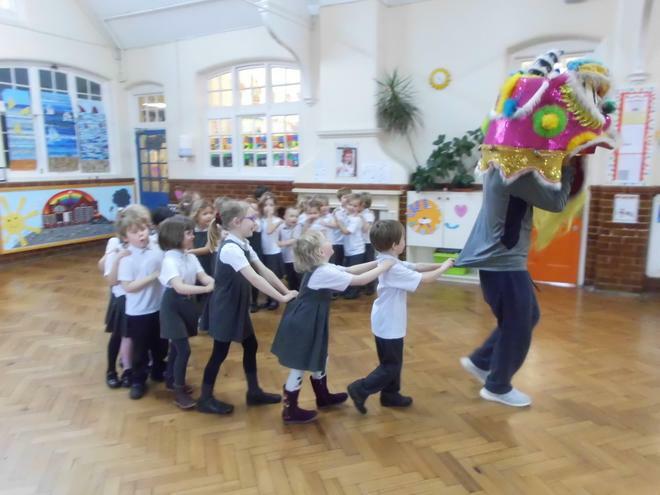 They learnt the dance moves and then had a go at holding the heavy lion's headdress whilst stomping and jumping. 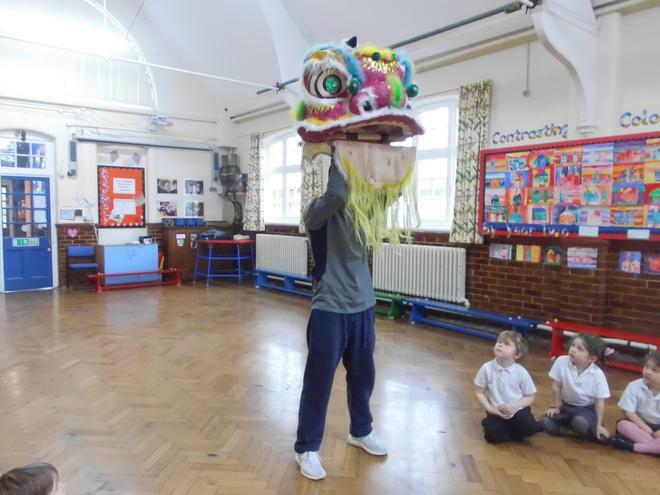 In the classroom the children created their own lion and dragon masks to dance with. 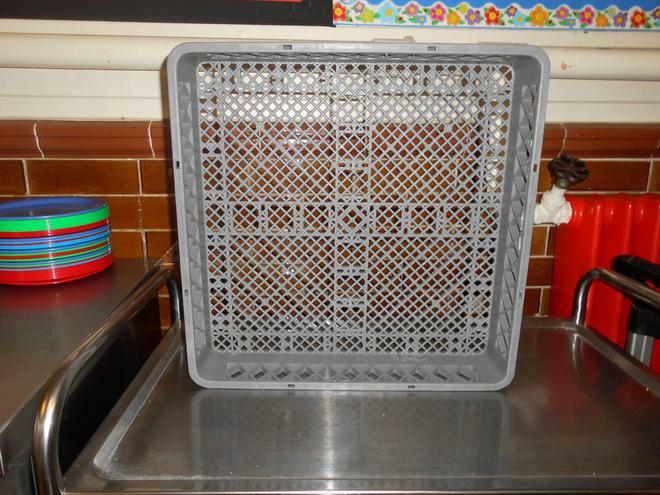 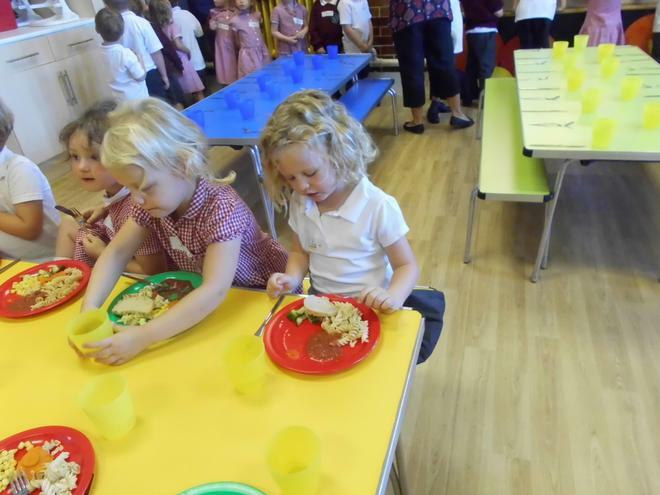 They had a go at using chopsticks and challenged themselves to pick up different small objects in the tray. 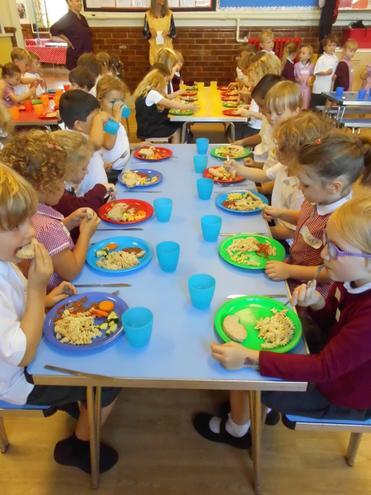 At lunchtime, the children enjoyed eating a Chinese meal, which included Chinese chicken, vegetable spring rolls, noodles and prawn crackers. 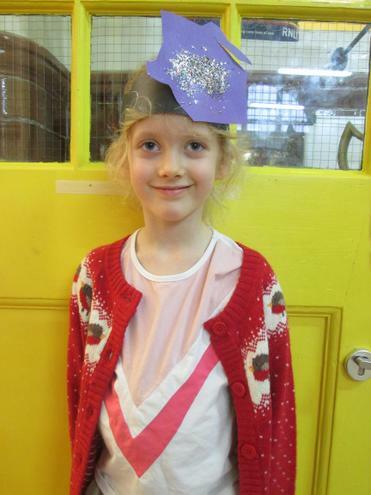 This week we have been finding out about the Hindu Festival of Lights, Diwali. 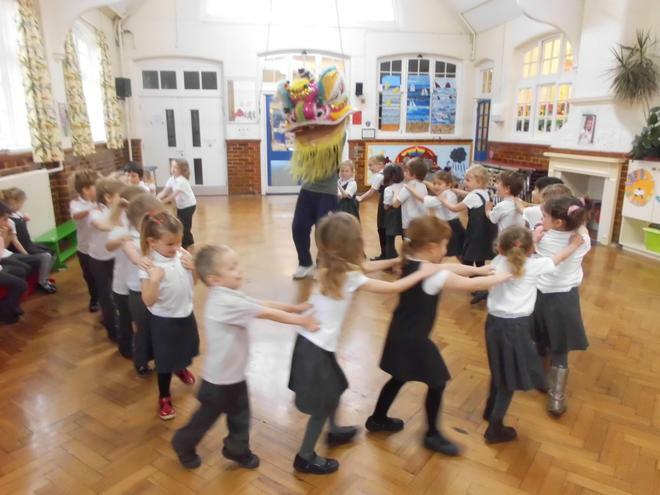 The children have enjoyed listening to the story of Rama, Sita and Ravana the demon king. 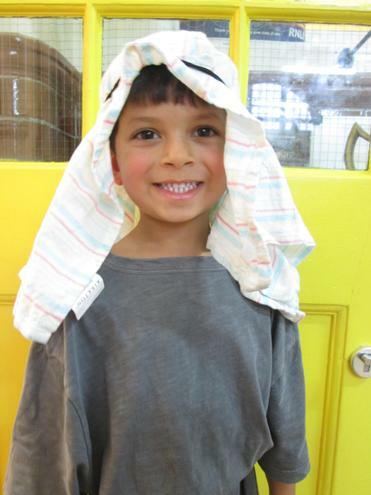 We have had a busy week of role playing the story, creating 'Missing Person' posters and building bridges. 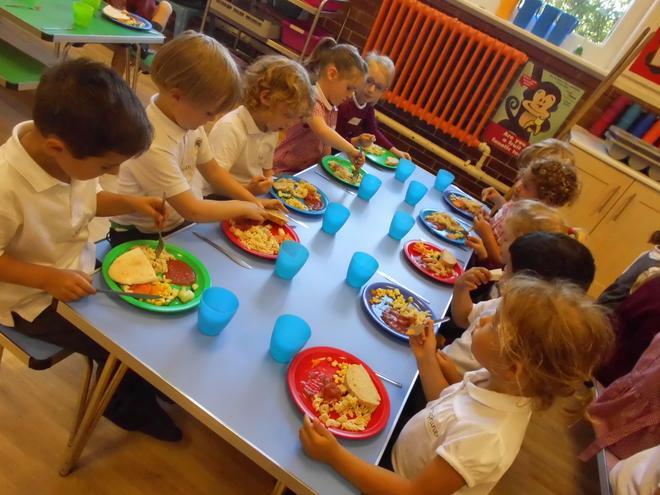 We finished the week tasting different Indian food and creating diva lamps with clay as part of our own Diwali celebration! 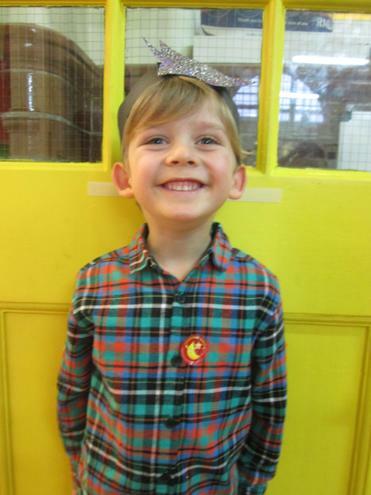 We had so much fun wearing our pyjamas all day for Children in Need! 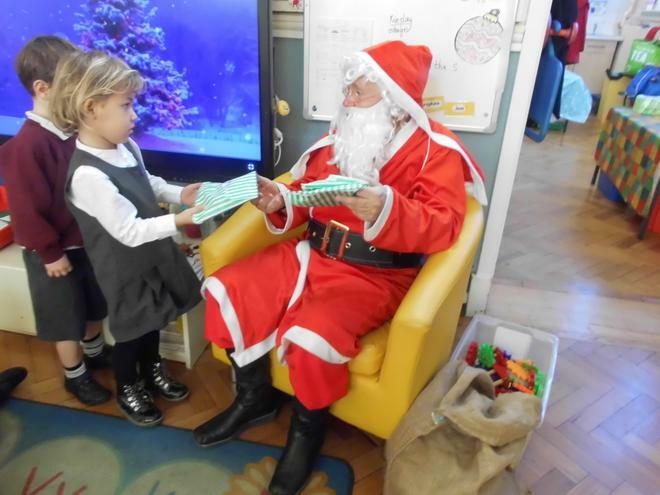 We loved the book swap and were all very happy with our new books to take home. 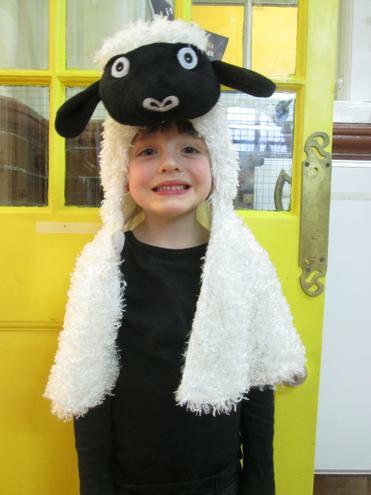 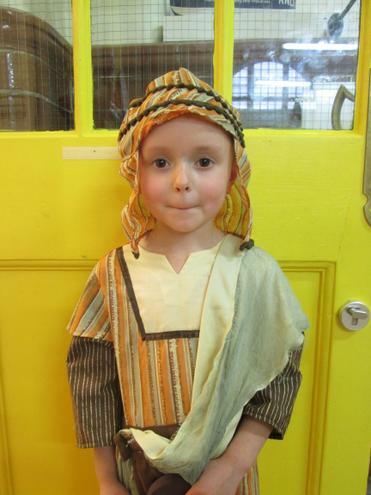 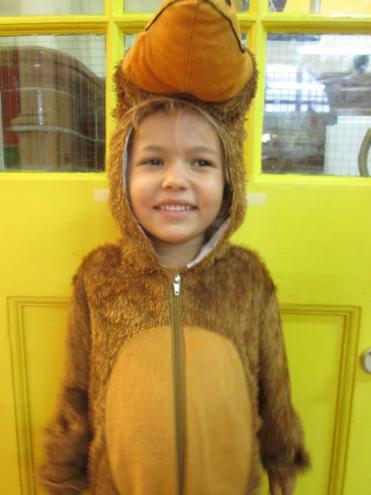 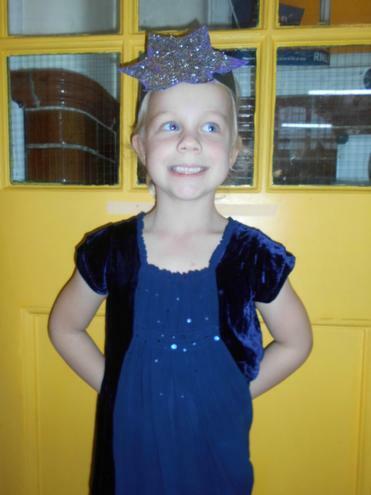 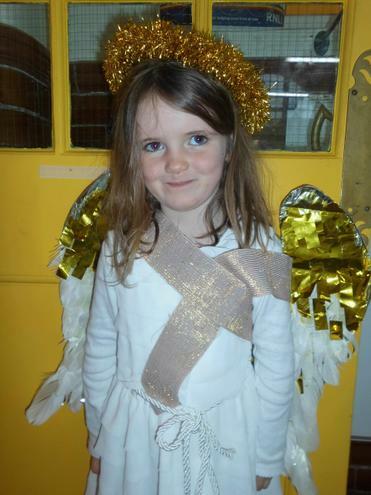 The children did amazingly in their Yr R Christmas Nativity performance! 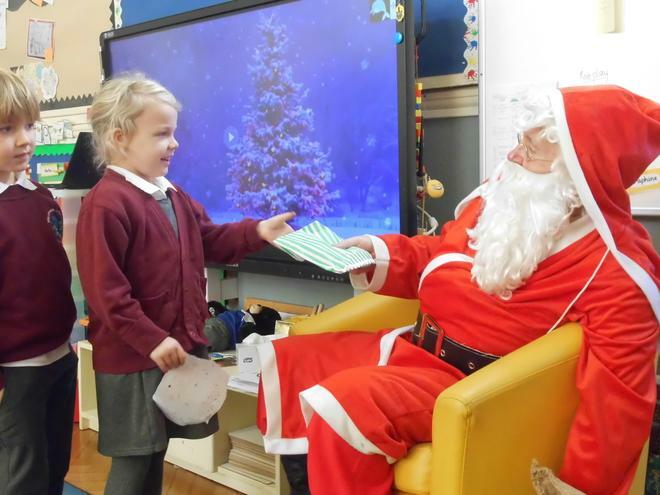 They all sang, spoke, acted, played instruments and joined in, putting on a great performance for both the whole school and their families. 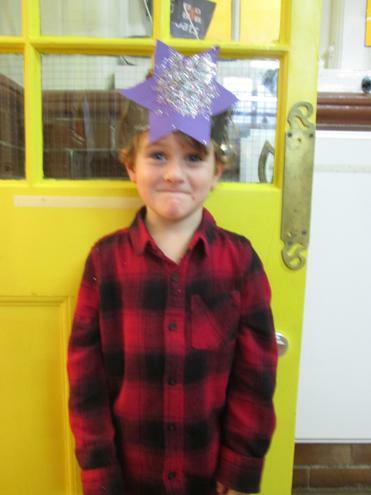 Everyone was very proud of them all! 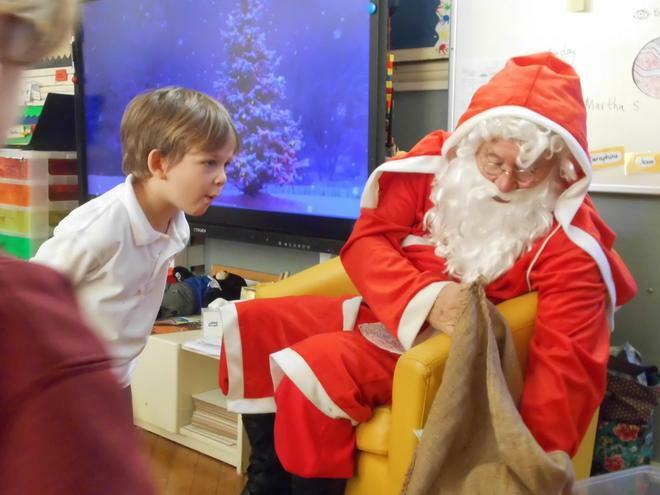 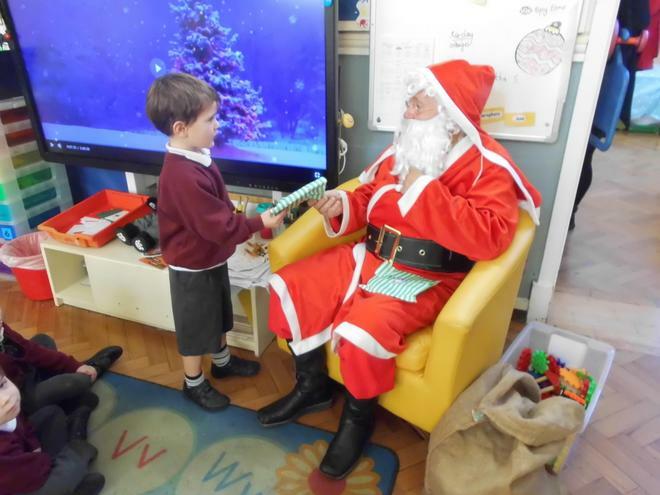 Yellow and Orange class visited Seasalter Christian Centre to find out how Christians celebrate Christmas at this time of year. 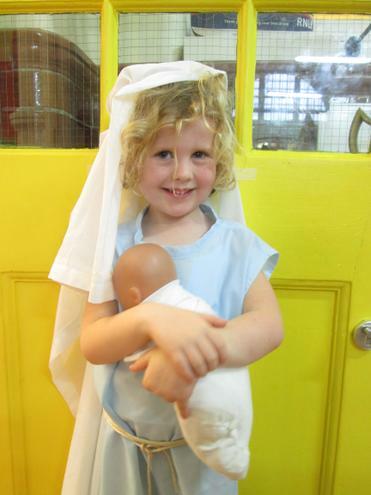 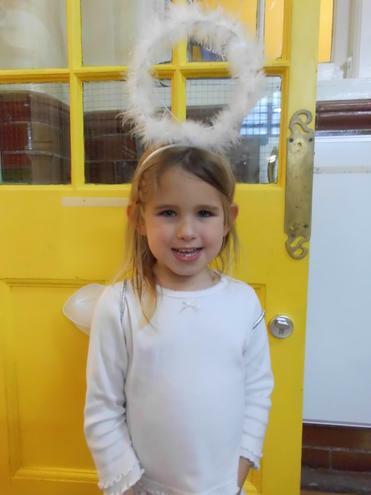 The children took part in dressing up as Nativity characters and rein-acting the Nativity story in the large stable, making their own Christingles and even had a lots of fun bouncing on a bouncy castle! 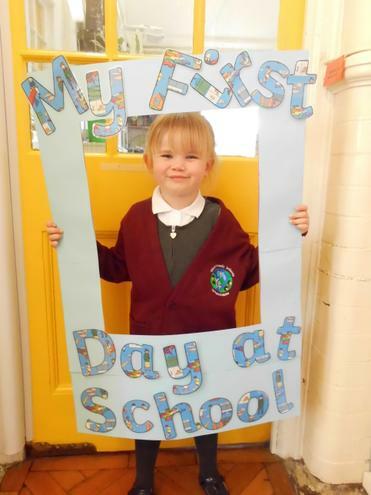 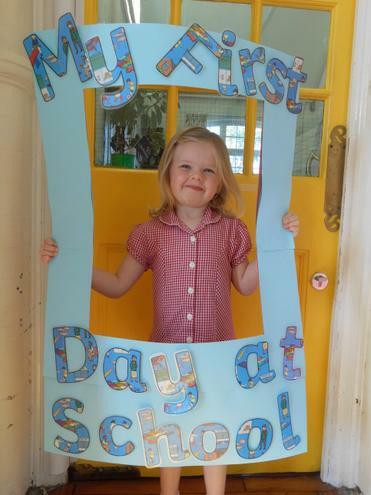 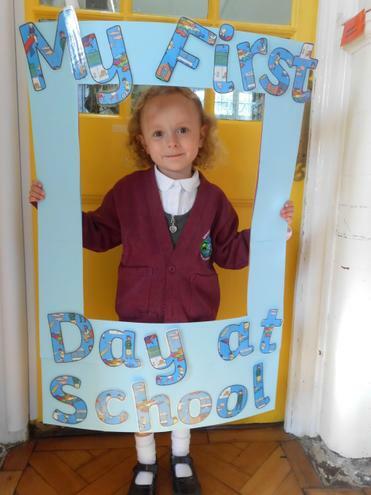 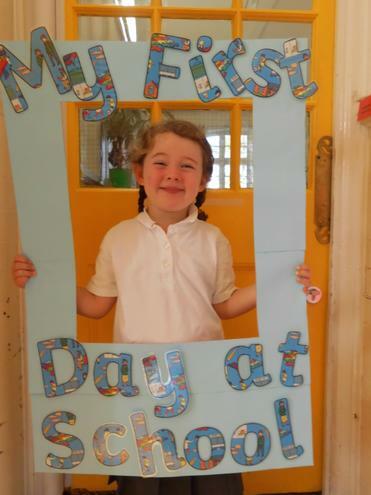 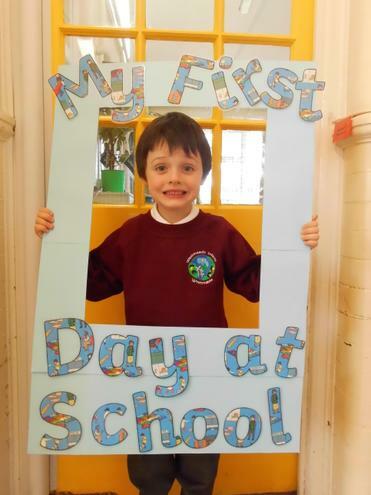 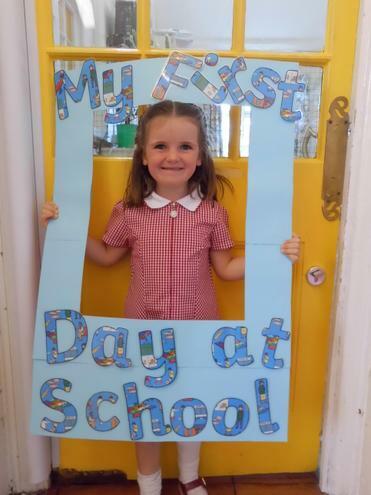 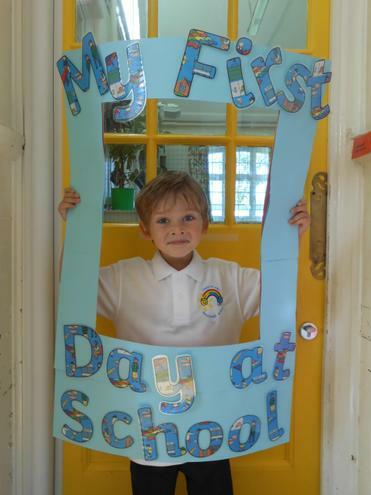 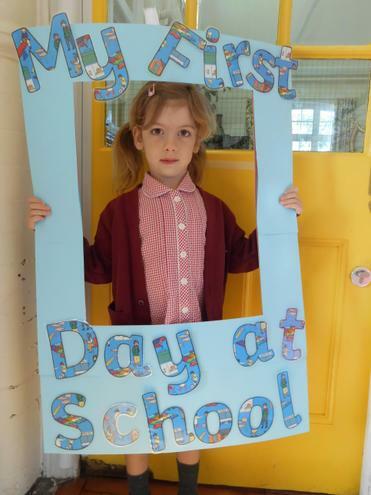 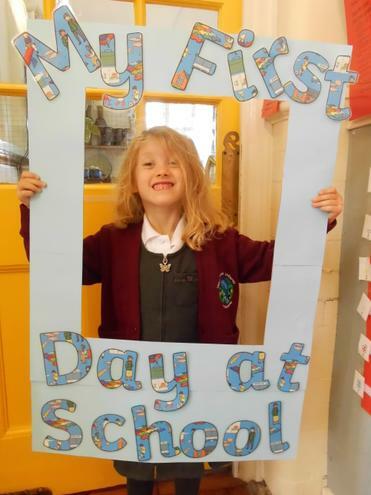 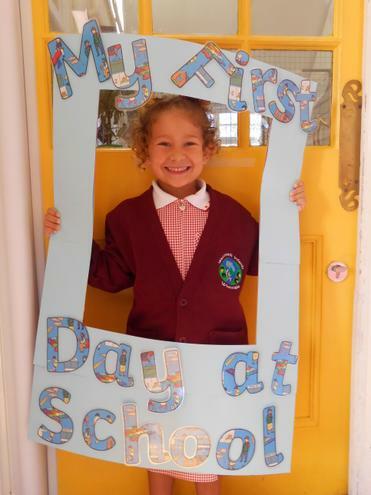 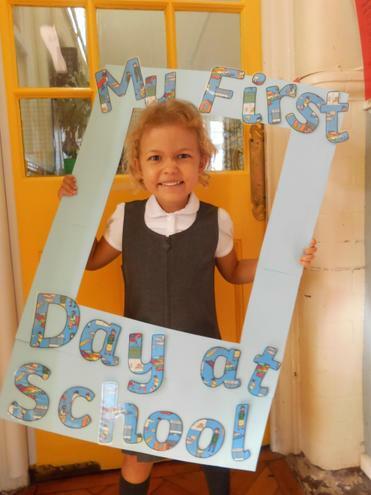 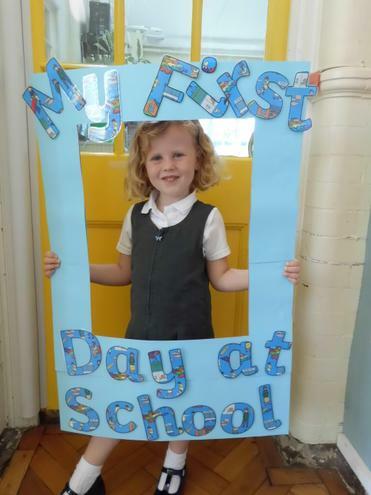 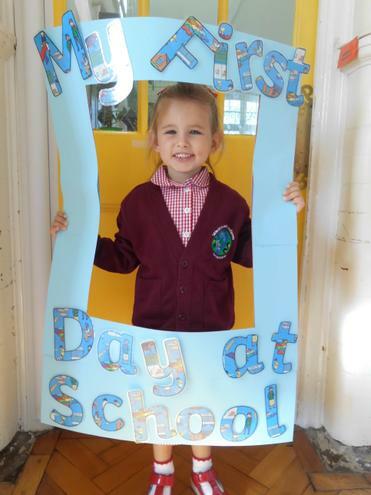 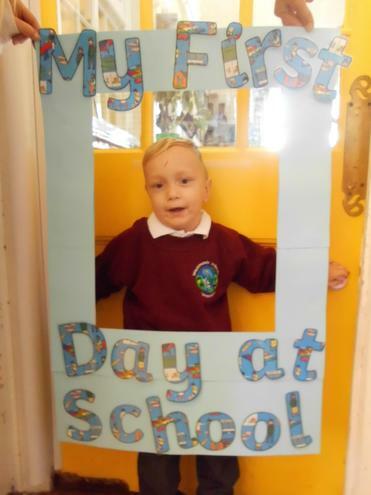 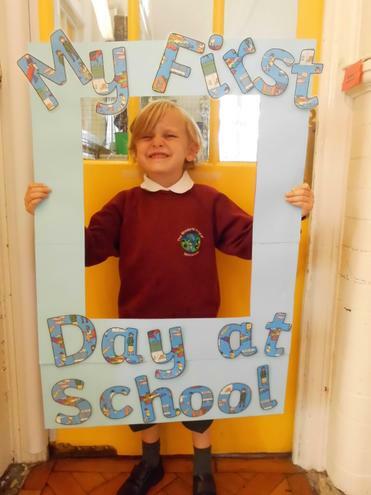 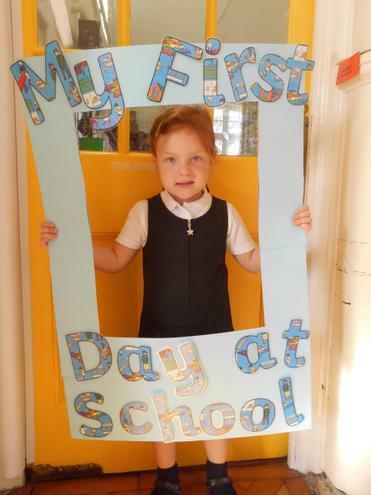 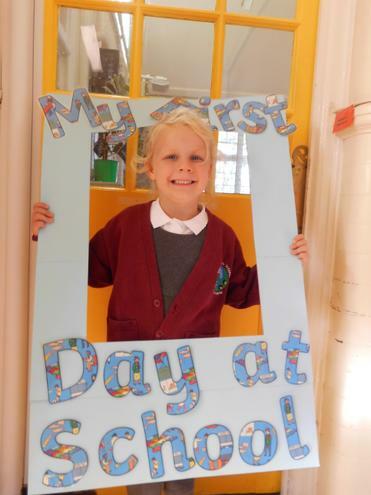 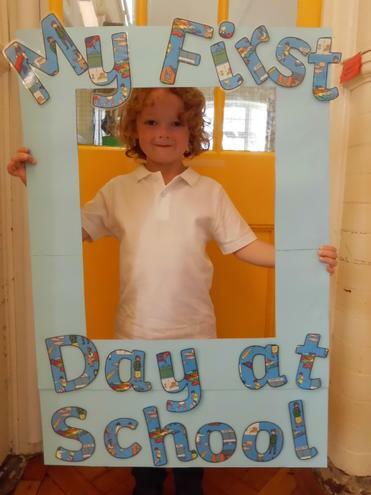 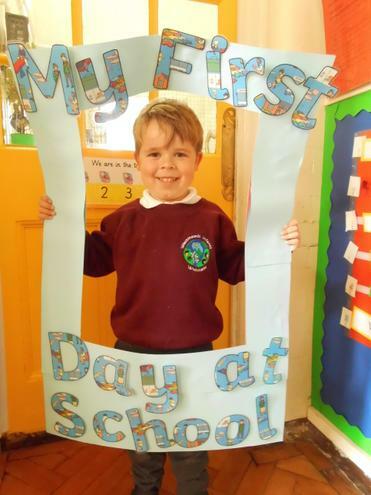 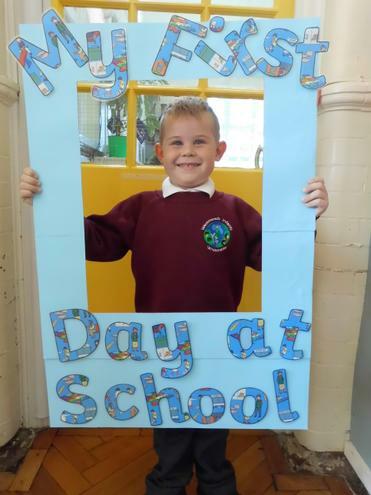 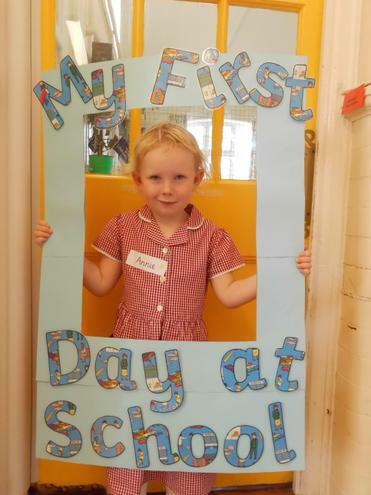 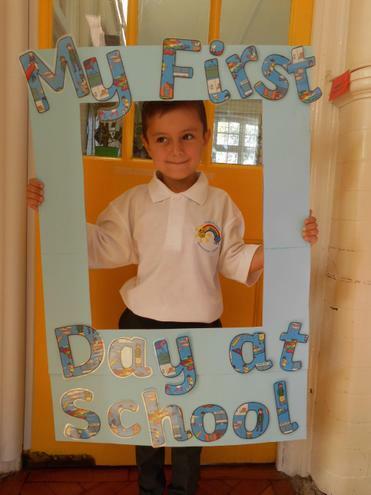 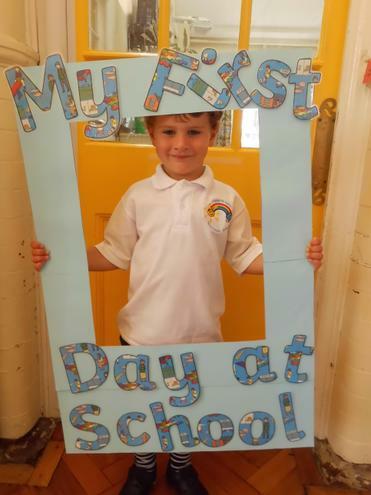 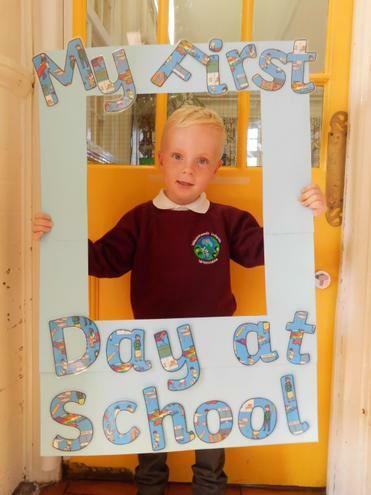 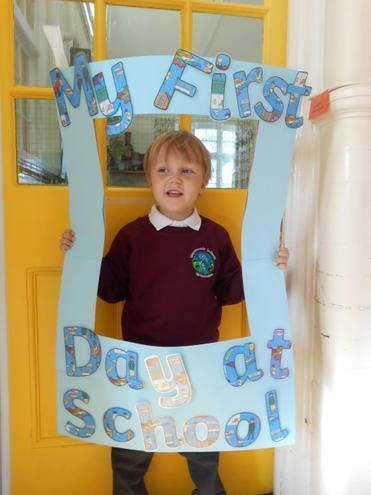 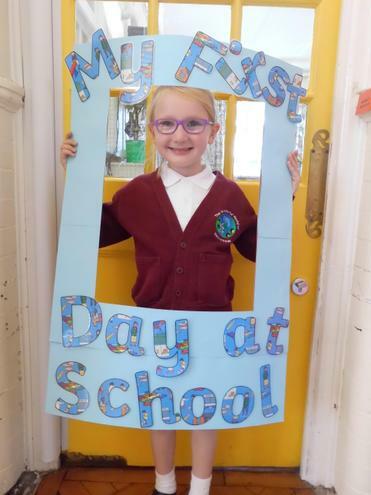 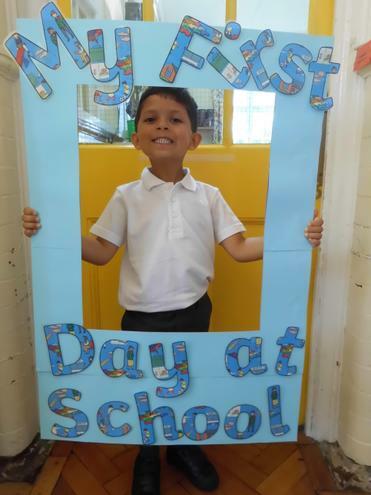 This was also their first trip on the new school mini-bus and the children loved every minute! 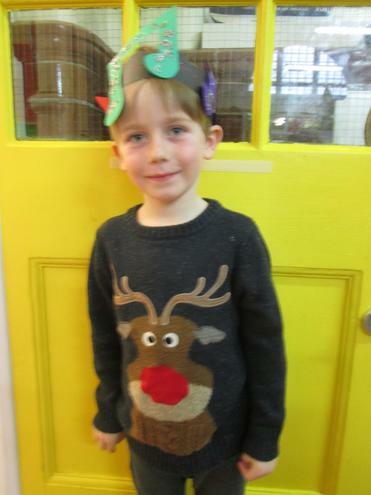 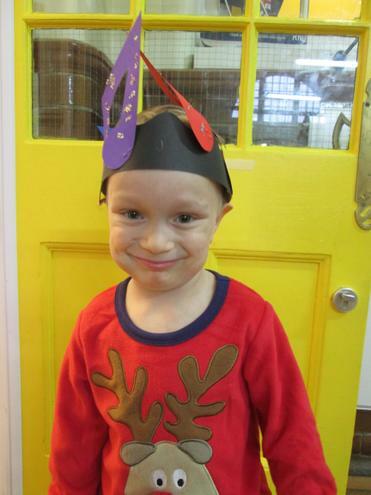 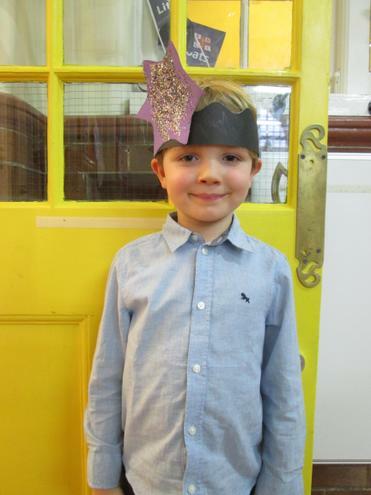 All the children had fun participating in the Christmas Activity Morning! 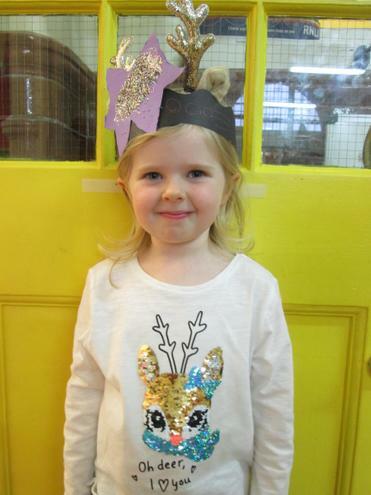 They made reindeer food and Christmas decorations. 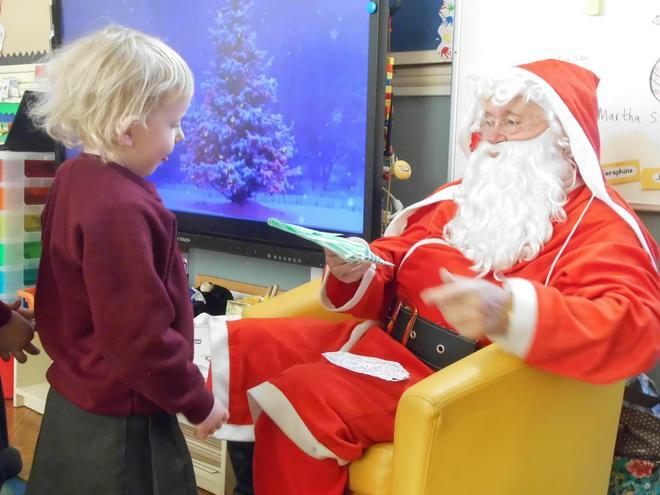 They would like to say a big 'Thank you' to all the Friends of Westmeads for organising it all. 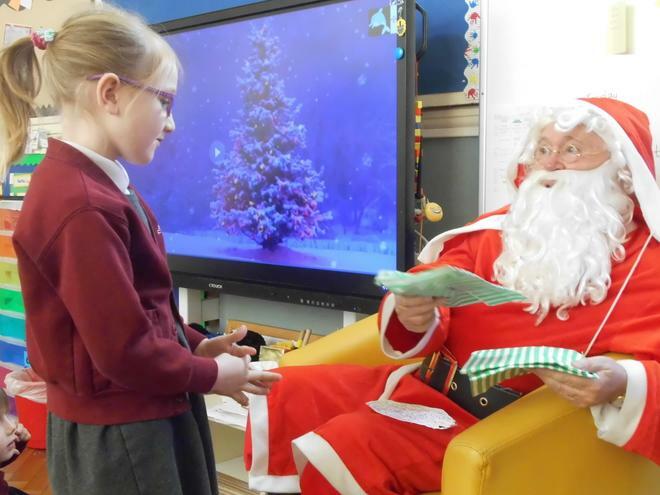 We were so excited when we heard the jingle bells coming towards our classroom! 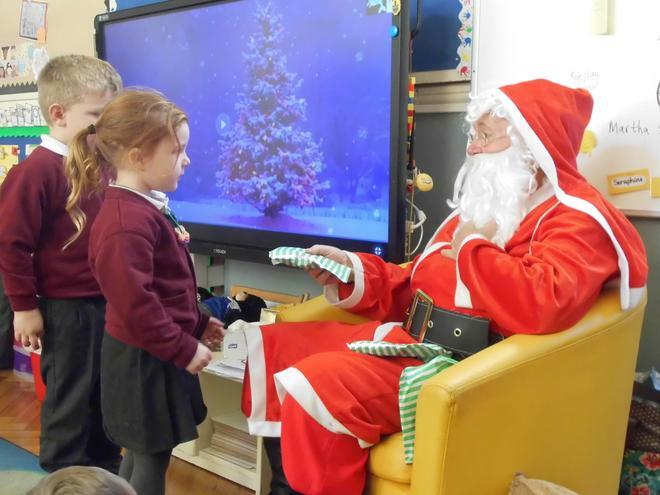 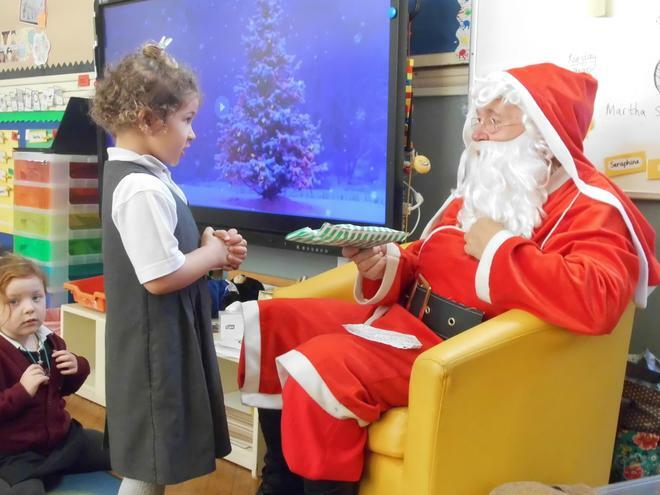 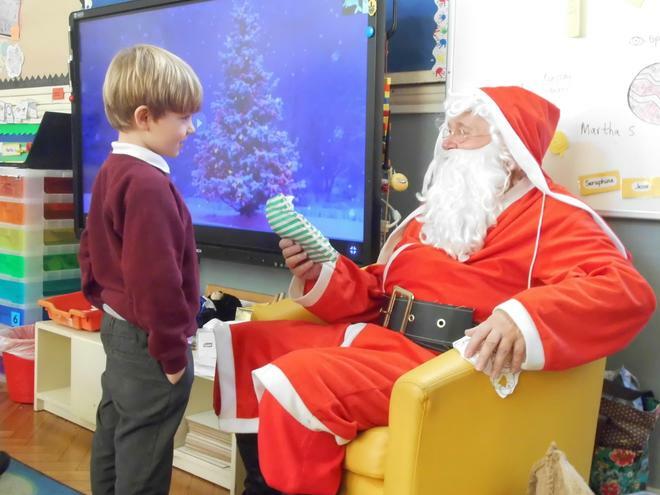 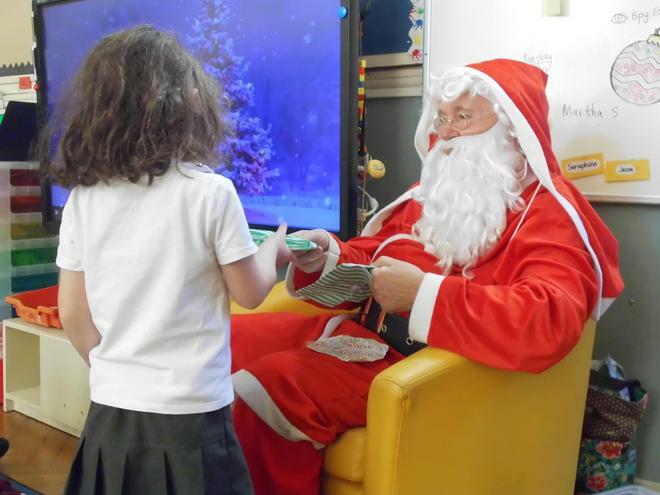 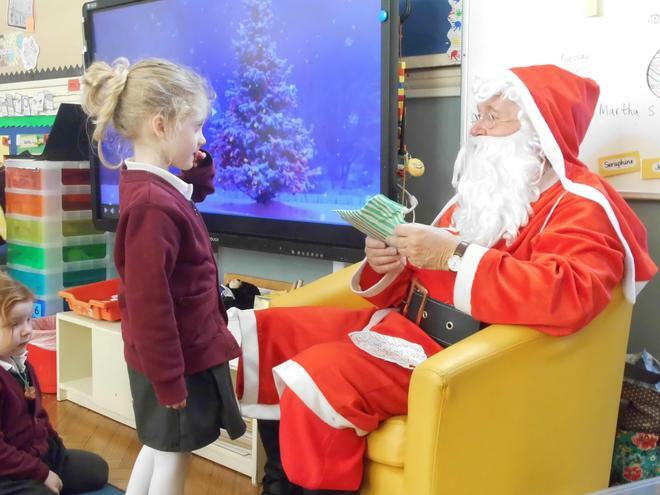 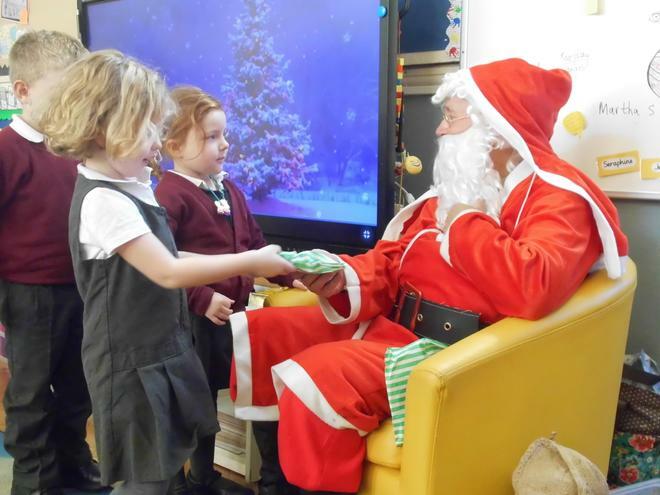 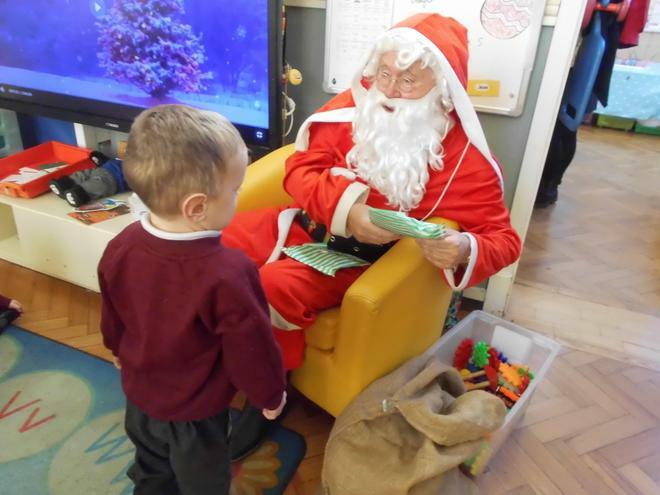 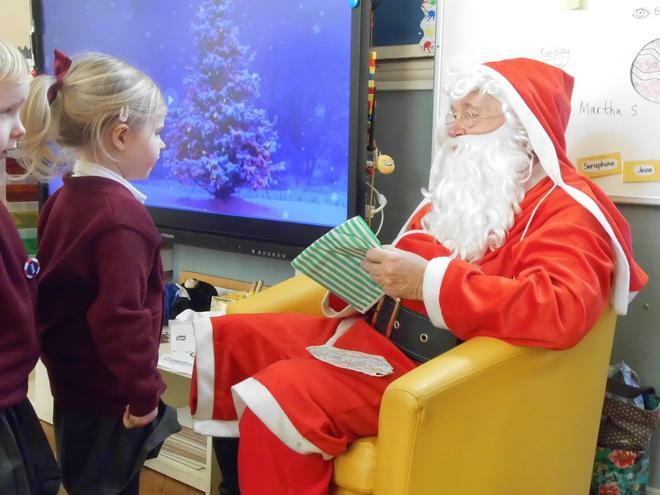 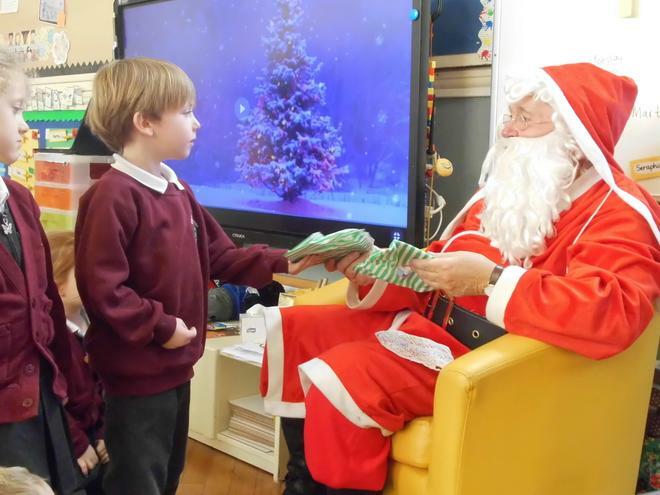 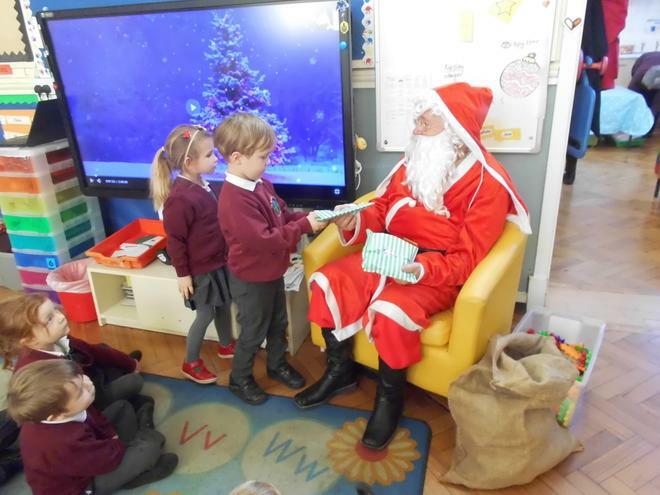 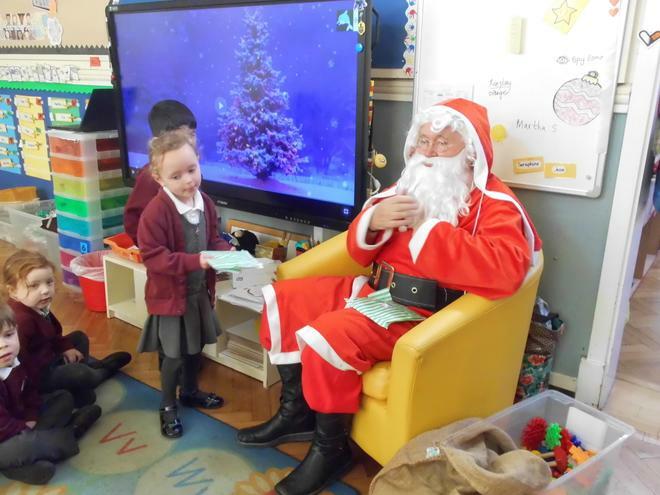 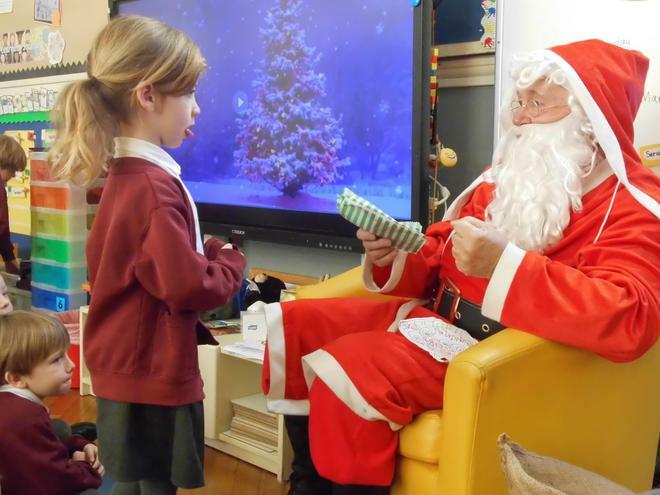 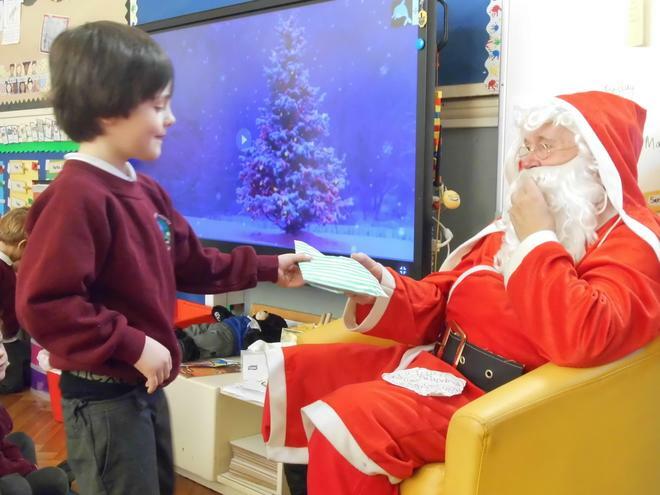 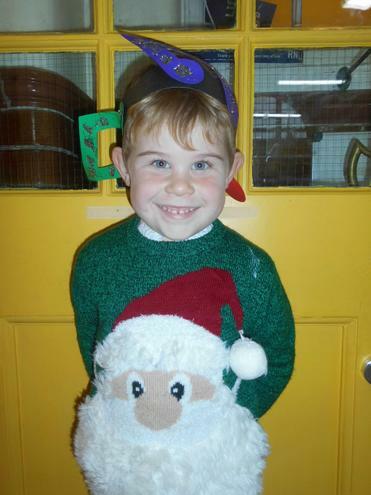 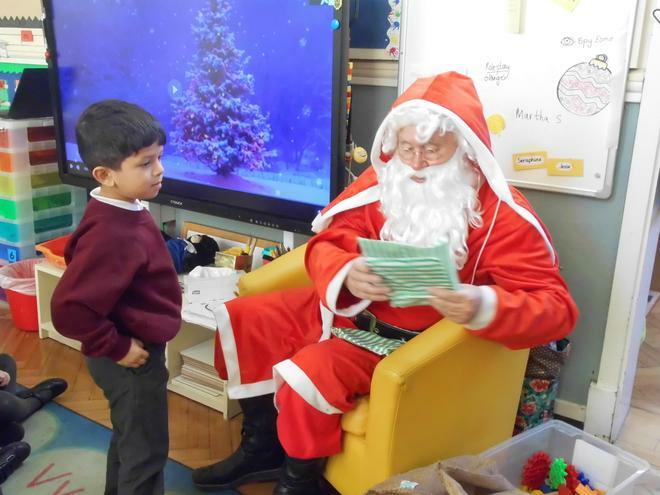 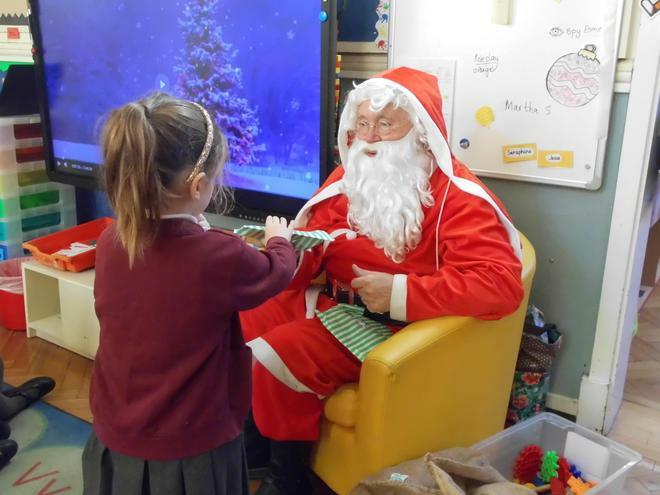 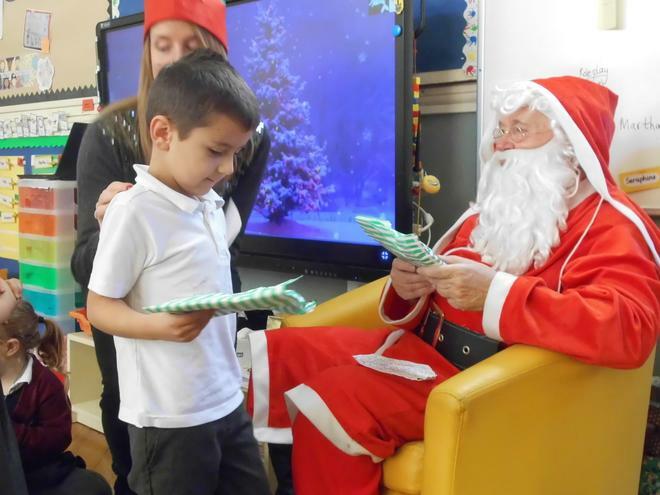 Father Christmas gave everyone a present and asked each child what they would like him to bring them on Christmas Day! 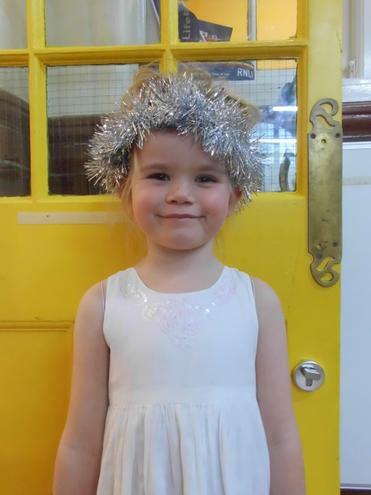 Everyone enjoyed their Christmas lunch in the hall with the whole school, which included crackers and singing 'We wish you a merry Christmas'! 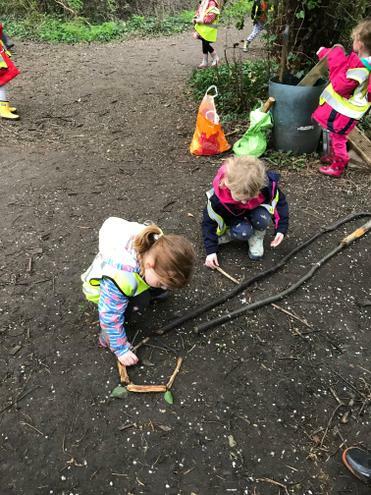 We have learnt how to control different tools such as paintbrushes, glue sticks and scissors safely and carefully. 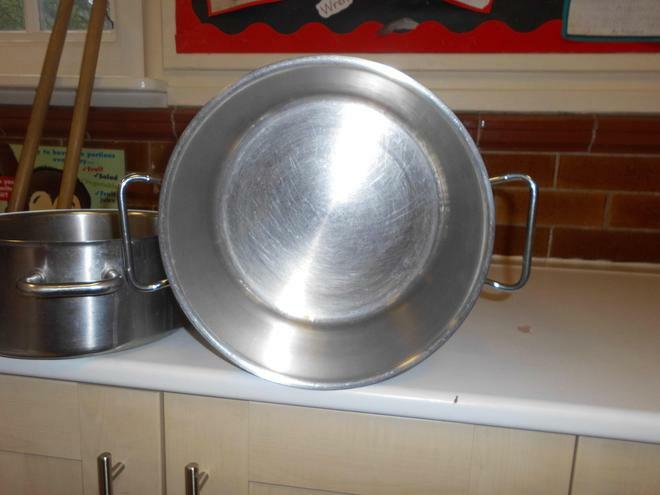 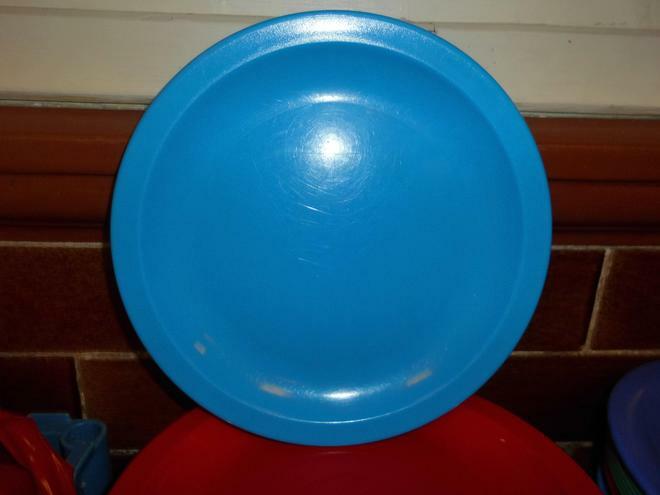 We had to use good control with the paint and glue and remember to scrap the glue stick or paintbrush on the side of the pot so we didn't dribble across the table. 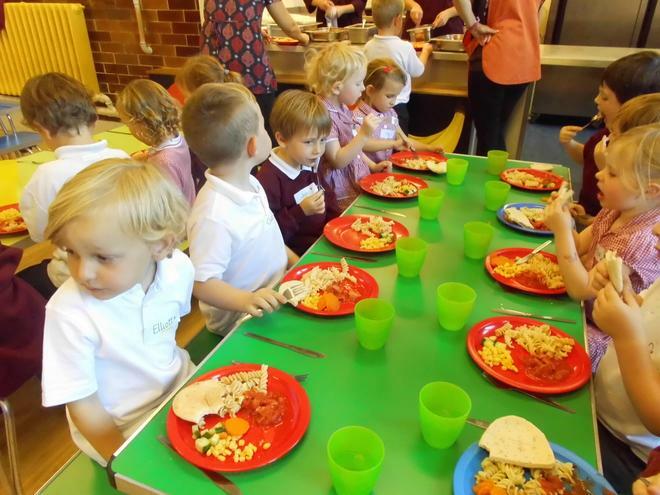 We practiced carrying scissors safely to the table. 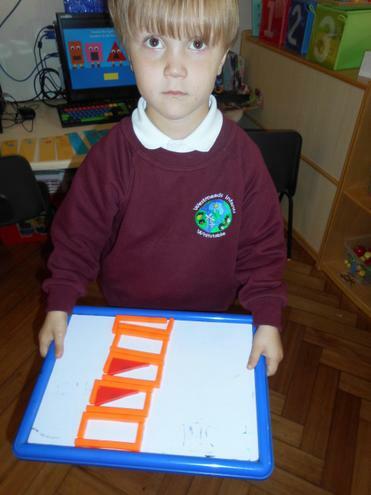 We learnt how to trace a picture and then had to add handwriting patterns using the special handwriting pens. 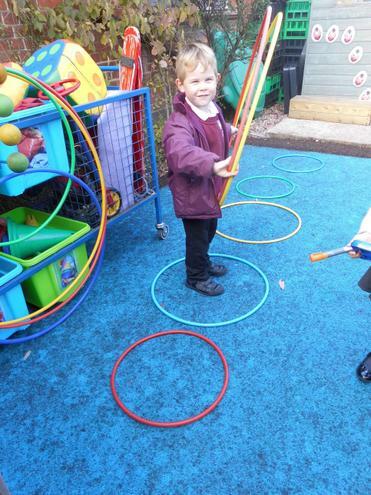 We had to control the pen and pencil carefully to make different shapes and patterns. 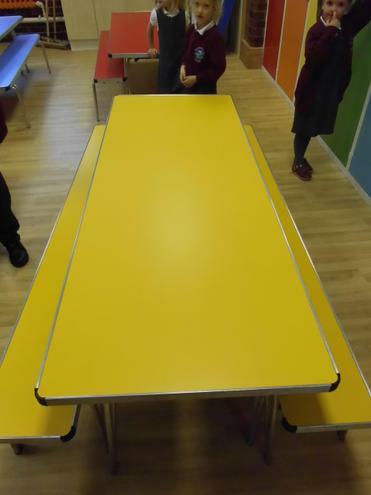 We found out where everything is kept on the office table area and learn how to tidy it away carefully in the right places ready for the next person. 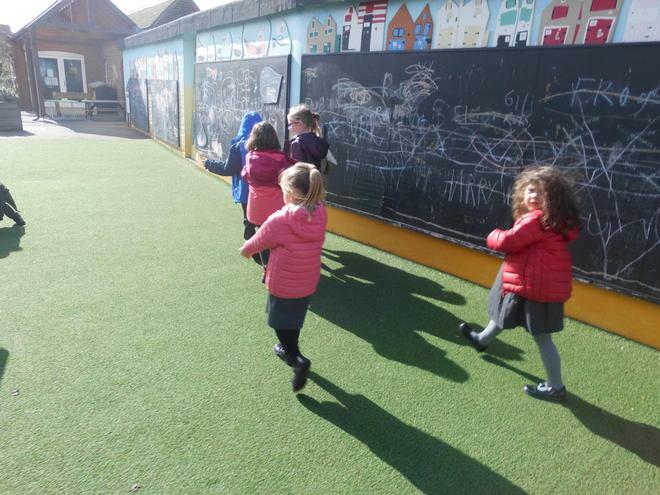 We always have to remember to write our name on our work! 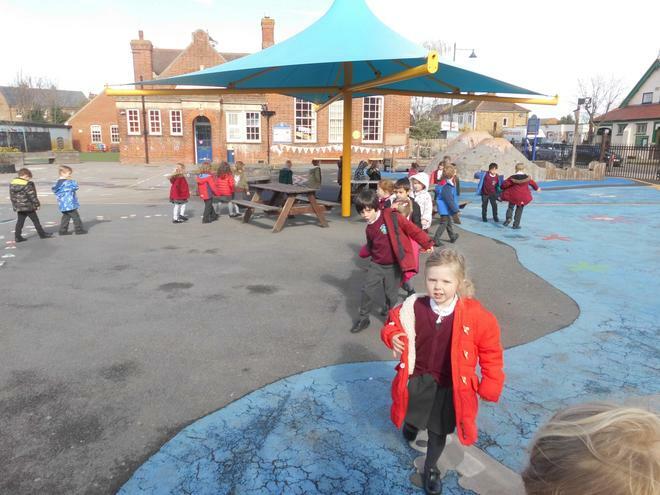 We learnt how to use the playdough area and thought about the different things we could make using the different equipment. 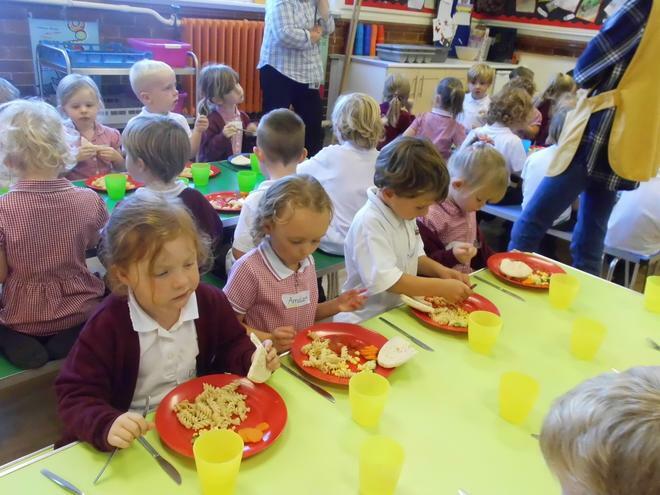 We explored rolling, pressing, squeezing and cutting the playdough. 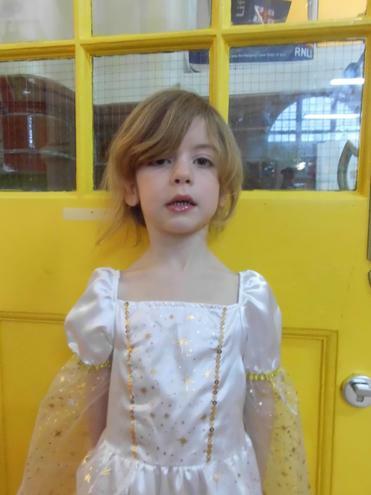 We found out where all the dressing up clothes are kept and practiced getting ourselves dressed and undressed into the costumes independently. 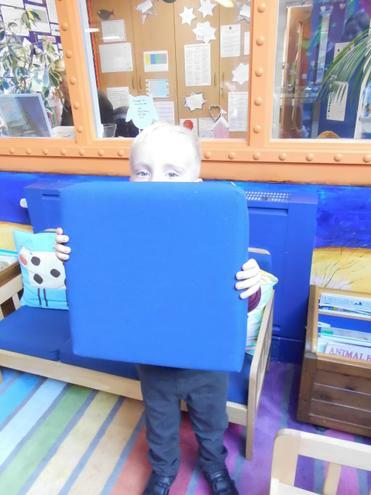 We used our imagination to act in the role play house, pretending to do the jobs in the kitchen and taking on different roles. 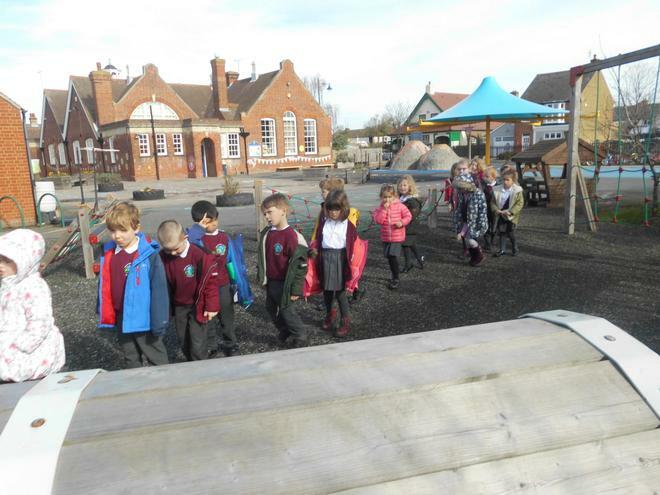 We learnt about the small world equipment and where it is kept. 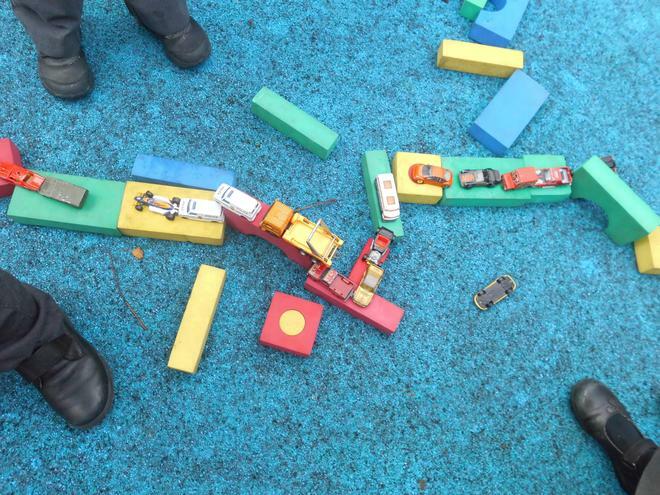 We used our imaginations to create different worlds. 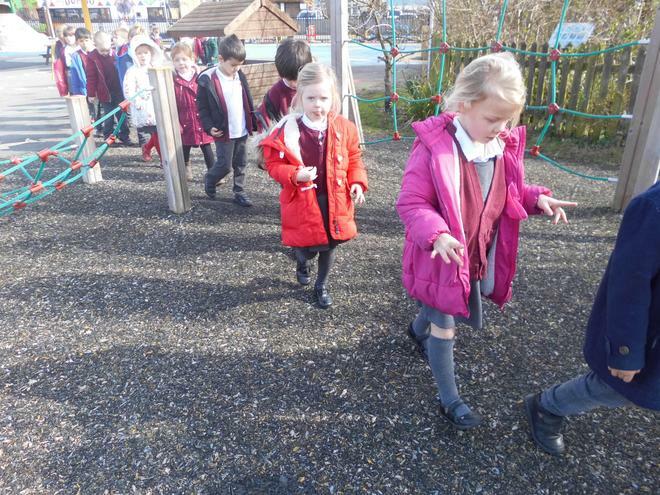 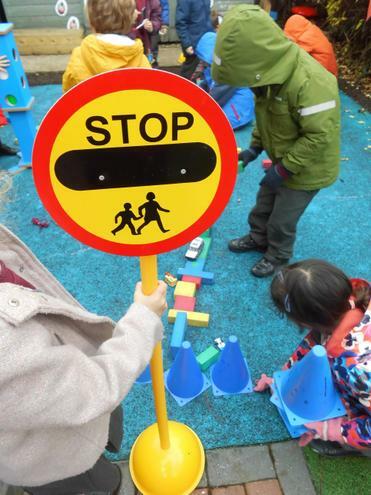 We have enjoyed playing with all the different equipment in the playground and learning to get on and off safely and carefully.